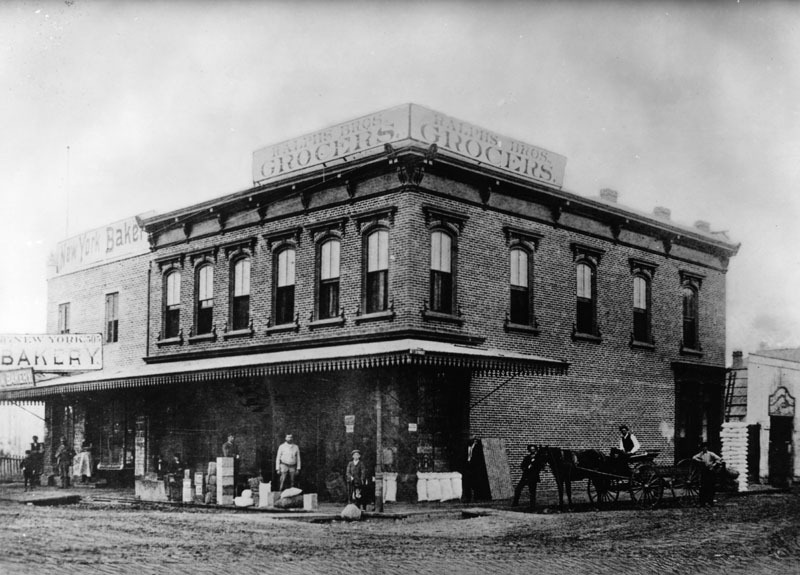 (1886)* - Exterior view of Ralphs Bros. Grocers, located on the southwest corner of 6th and Spring Streets in 1886. A horse-and-carriage is parked in the unpaved street. This was known as "Georgetown Corner." The photo was taken shortly after this two-story brick building was built. Next door on Spring Street is the New York Bakery. George A. Ralphs is leaning on a stack of boxes, and Walter B. Ralphs is in shirt sleeves (He died in 1954 at age 99). (ca. 1890)* - View of the Bellevue Terrace Hotel located at the northwest corner of Figueroa & 6th streets. Two horse-drawn carriages wait my the curbside. Today it is the site of the Jonathan Club. Click HERE to see more in 1890s Oil Boom. (ca. 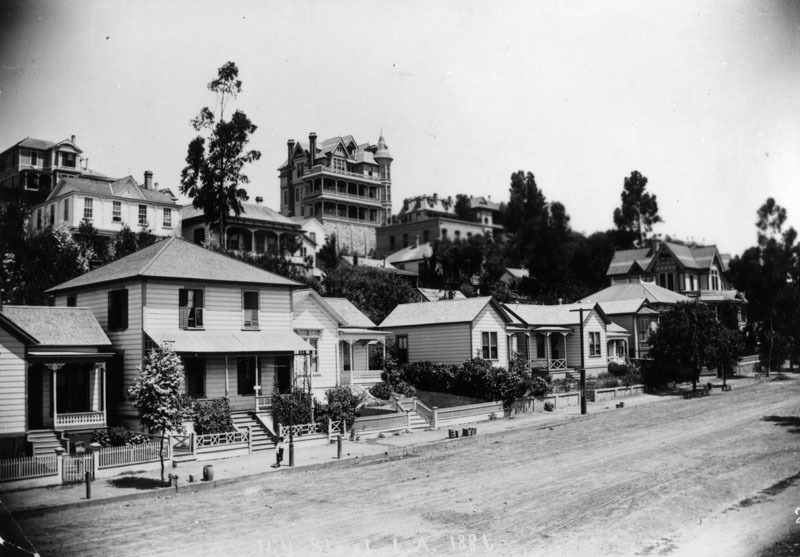 1880s)* - View looking southwest towards Bellevue Terrace and Pearl Streets (6th & Figueroa), with the Bellevue Terrace Hotel seen at center-left. Pearl Street became Figueroa Street, and Bellevue Terrace 6th Street. 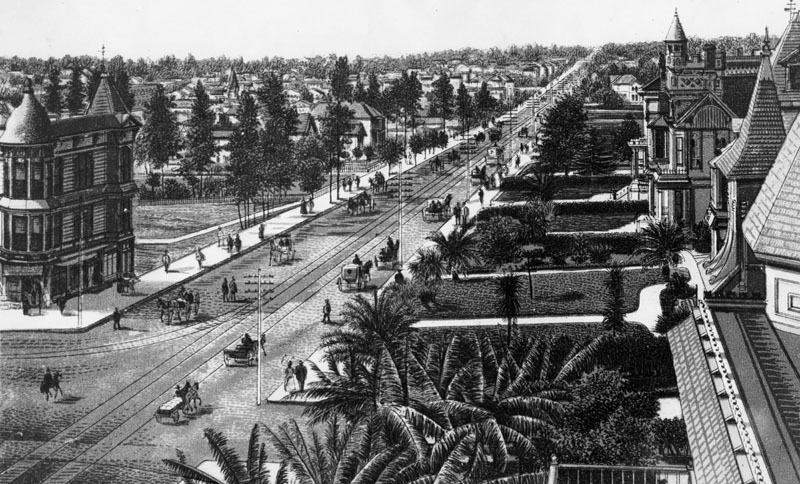 (1885)* - Photo of an early lithograph showing Figueroa Street looking south from the Bellevue Terrace Hotel on the N/W corner of Figueroa and 6th streets. Photo caption reads: "View on Pearl Street, south from Bellevue Terrace, showing banana and palm plants, and cypress hedges." Pearl Street became Figueroa Street, and Bellevue Terrace 6th Street. (1880s)* - View of Pearl Street (Figueroa) near Bellevue Terrace (6th Street) with horse carriages and the Bellevue Terrace Hotel (N/W corner) at the far right. Two stylish Victorian homes are seen on the left. (ca. 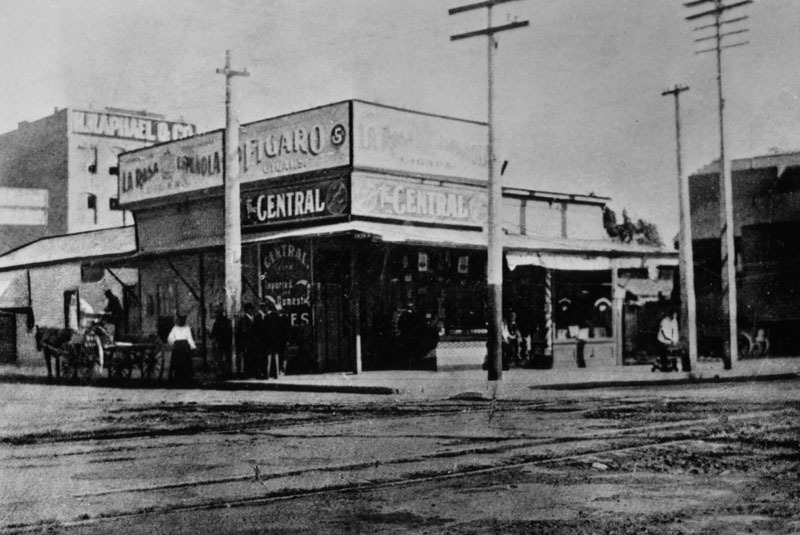 1890)^^* – Close-up street view of the grand Bellevue Terrace Hotel, Figueroa Street and Sixth Street, looking southwest. The three-story Victorian wood structure has a covered porch and two balconies in front, a balcony running along one side of the 2nd floor, and an octagonal tower with turret. Six gabled windows poke out of the roof visible in this perspective. The groomed lawn is separated from the front sidewalk by a low retaining wall. A utility pole stands at the corner. A picket fence leads off to the right. An adjacent building is visible at left. (ca. 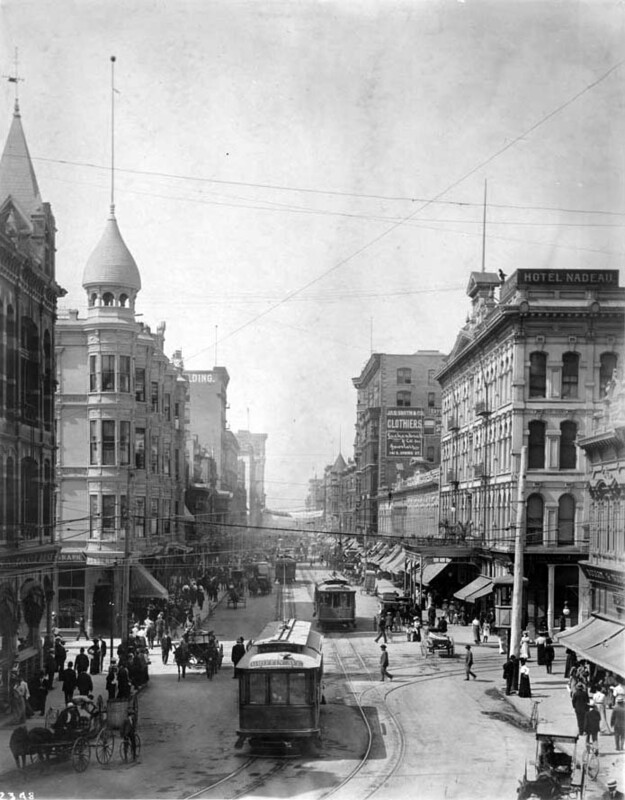 1910)*^# – View looking north on Figueroa Street from the corner of Sixth Street. That hulking silhouette behind the palm trees at left is the Bellevue Terrace Hotel. Two young boys are seen in the street as an early model electric car drives by. (ca. 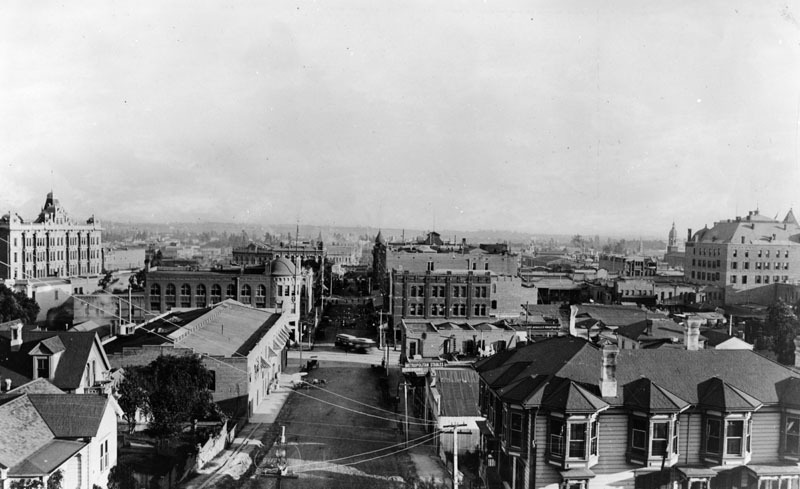 1916)^^* – Panoramic view looking northwest on Figueroa Street from near Sixth Street. The Bellevue Terrace Hotel stands at lower-left. (ca. 1916)^^* – Closer view of the Bellevue Terrace Hotel with Sixth Street seen at lower left. 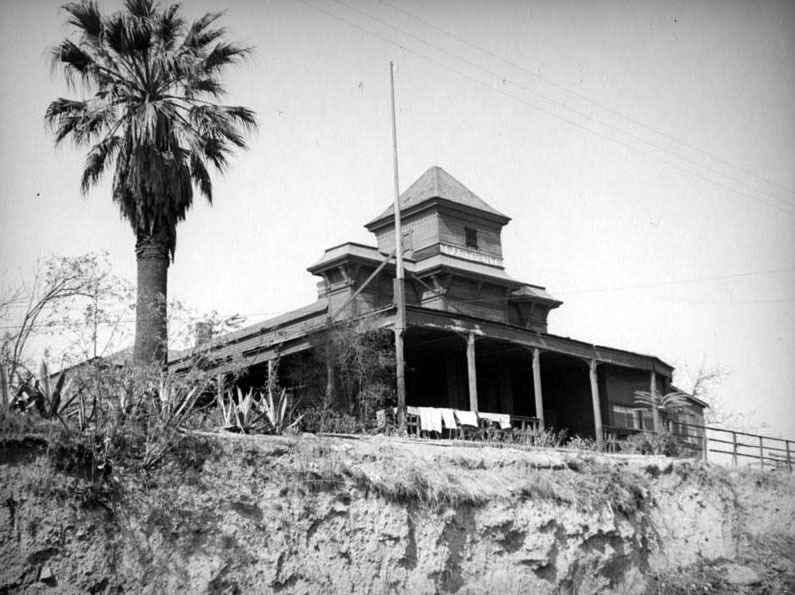 In 1924, the Jonathan Club would be built on the NW corner of Figueroa and Sixth streets, where the Bellevue Terrace Hotel stood since circa 1890. (1880s)* - View of the front of the Boston Dry Goods Store. Three women are window-shopping in front of the large display window. The Boston Store was first started at Spring and Temple Street in 1883 by J.W. Robinson. 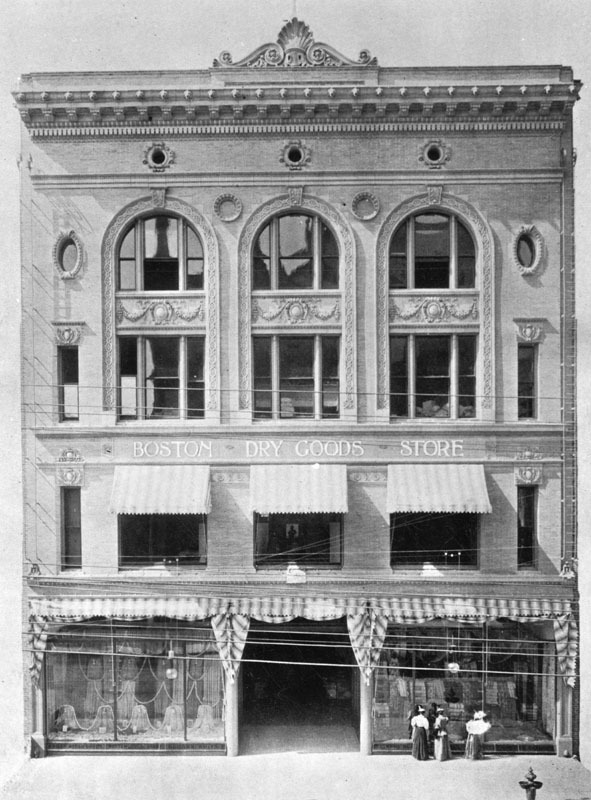 The “Boston Dry Goods Store” began business in February of 1883 at the corner of N. Spring and Temple Streets. Joseph Winchester Robinson advertised that his establishment was characterized by “fine stocks and refined ‘Boston’ service.” The arrival of railroads spurred the enormous and long-lived growth of Southern California, and Robinson’s store brought eastern goods and their attendant sophistication to a willing (and growing) public; in 1887 the store was forced to move to larger quarters at 69-73 N. Spring Street. After returning from a trip back east in 1891, Robinson became ill and passed away in his home at the age of 45. His father, H.W. Robinson came to Los Angeles for the funeral and to look after the business founded by his late son. 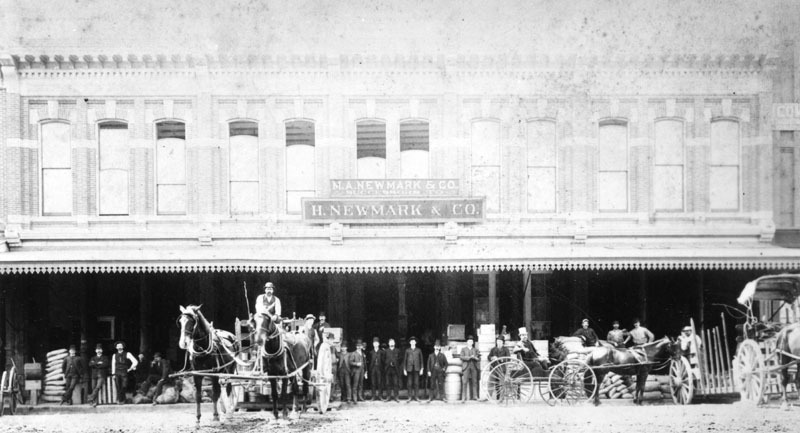 (1886)* - People, horses and buggies lined up in front of H. Newmark & Co. in the Amestoy Block in 1886. Harris Newmark emigrated to the United States in 1853 from Löbau in Province of Saxony (now Saxony, in eastern Germany) and settled in Los Angeles. 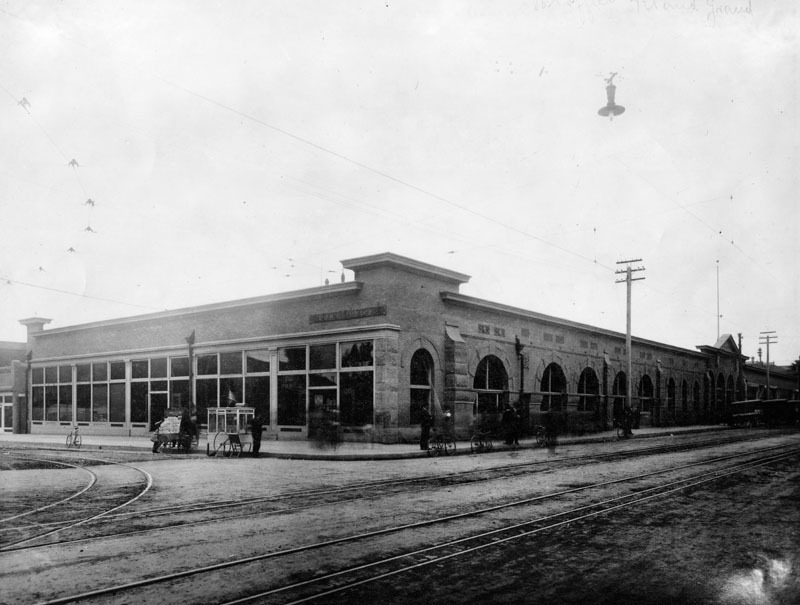 After working in partnership with his brother, he eventually established his own wholesale grocery business, H. Newmark and Company, in 1865, with headquarters on Spring Street. He went on to invest in real estate, holding large tracts in the San Gabriel Valley. In 1875 he sold eight thousand acres of what was then the Santa Anita Rancho to rancher E.J. “Lucky” Baldwin. In May 1899, Newmark subdivided the tract (approx. 15,000 acres) owned by himself and his nephew, after contracting with William Mulholland to design and construct a suitable water system for the new settlement. A piece of this tract adjacent to the tracks of the San Pedro, Los Angeles & Salt Lake Railroad was developed into a town site called Newmark. The remaining land was subdivided into 5-acre lots suitable for small-scale agriculture. The entire settlement, including the Newmark town site, was given the name Montebello. 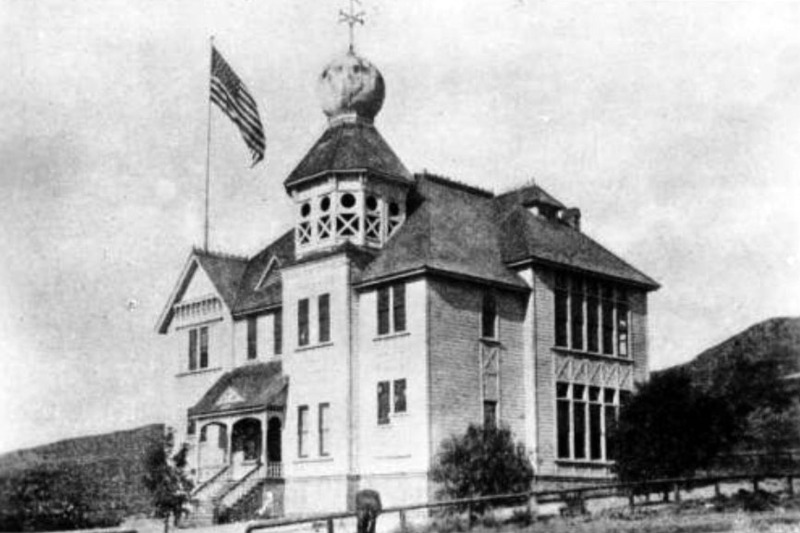 When the town incorporated in 1920, Montebello replaced Newmark as the new city's name. 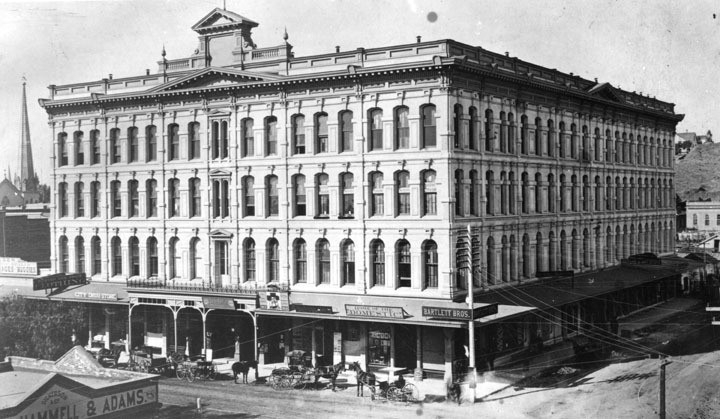 (1884)^^* - Panoramic view looking east on First Street from Hill Street, showing the 4-story Nadeau Hotel located on the southwest corner of First and Spring streets. Remi Nadeau was a French Canadian pioneer who arrived in Los Angeles in 1861 driving a team of oxen. During the silver-mining excitement in the Cerro Gordo region of Inyo County his teamster operation brought tons of silver to Southern California and hauled back food and supplies to the miners. By 1873 he operated 80 such teams. 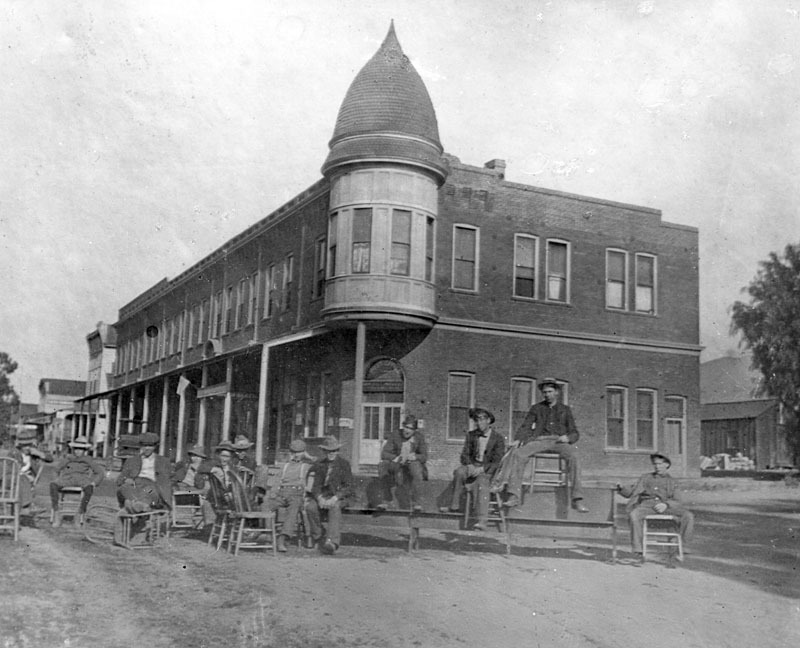 (1886)* - View of the Nadeau Hotel on the southwest corner of Spring and 1st streets. A row of horses & carriages is lined up on the street in front. A tall narrow church spire can be seen in the background on the far left. (ca. 1905)^^* - View showing the Nadeau Hotel on the southwest corner of Spring Street and First Street. The four-story hotel features arched windows all throughout the building on the second floor and up. In the center of the building facing the street on the left are small decorative pediments above each floor from the second floor and up. At the top, above all the other small pediments, is a larger and wider pediment. Further above it is yet another pediment where underneath it displays "Nadeau 1883." The first floor consists mostly of shops. Some stores have striped cloth awnings covering their window fronts. At the corner of the hotel, on top of the roof, is a corner sign that reads "Hotel Nadeua." (1889)* - View looking south on Spring Street at 1st. Pacific Railway Company’s new streetcars are now seen on the road. 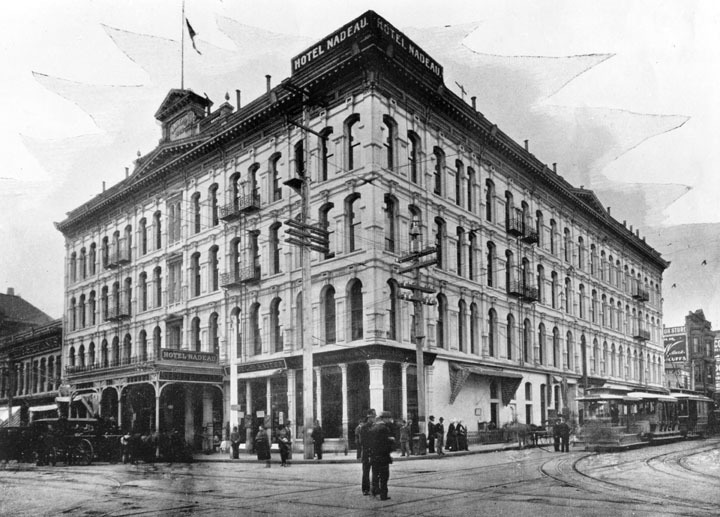 The 4-story Nadeau Hotel stands on the southwest corner of Spring and 1st behind the streetcar. 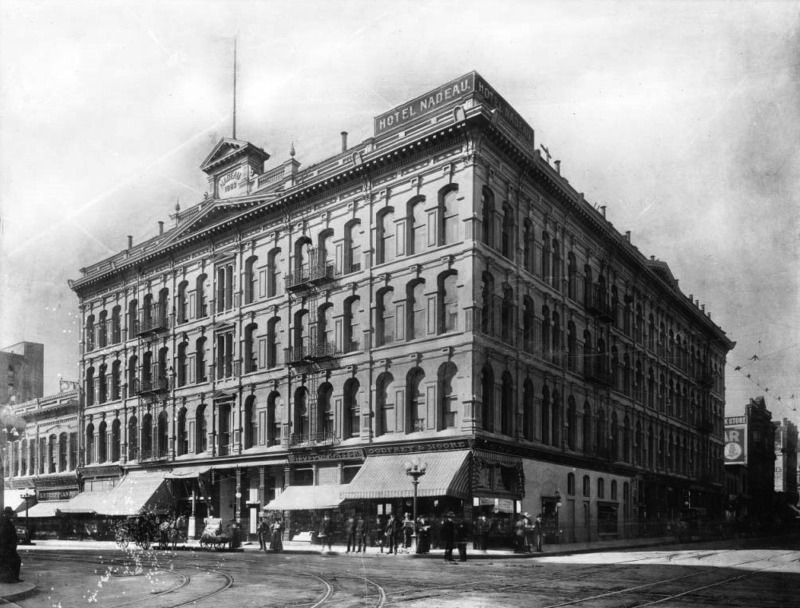 (1897)* - The Hotel Nadeau, showing the entire corner at 1st and Spring Streets, the present site of the Los Angeles Times. 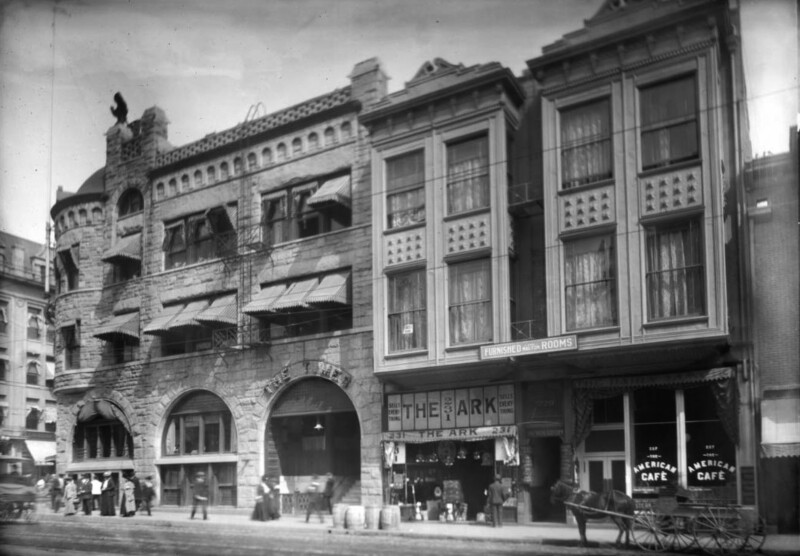 The hotel was built in 1882 as the first 4-story building in L.A. A paved street now visible. Horses, carriages, cars and trolleys, along with people are now visible. A sign giving the name of the hotel sets on the corner of the roof. The hotel advertises that it is heated by F.E. Brown's hot air furnace, and testimonials are available. Architects, Morgan & Walls. (ca. 1904)^^* - Intersection of Spring Street and First Street looking south. The Nadeau Hotel is visible at right behind the large circular sign that reads: "Up to date bargains, Crandall Aylsworth Company". (ca. 1905)* - View of Spring Street at 1st, looking south. The Nadeau Hotel appears on the right on the southwest corner of Spring and 1st streets. Spring St. was then the center of the city's financial activities. Electric cable cars share the street with horse-drawn wagons. 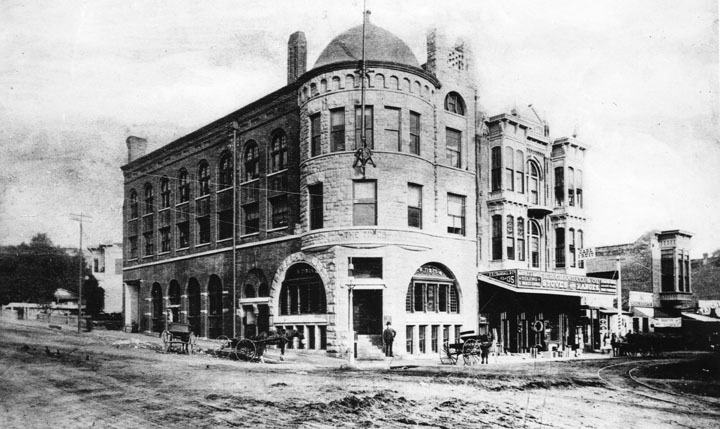 (1886)* - An early picture of the southeast corner of Spring and 5th St. when the building was occupied by Central Saloon. (ca. 1886)* - Family in front of home circa 1886. Note the two styles of bicycles used by the children. (ca. 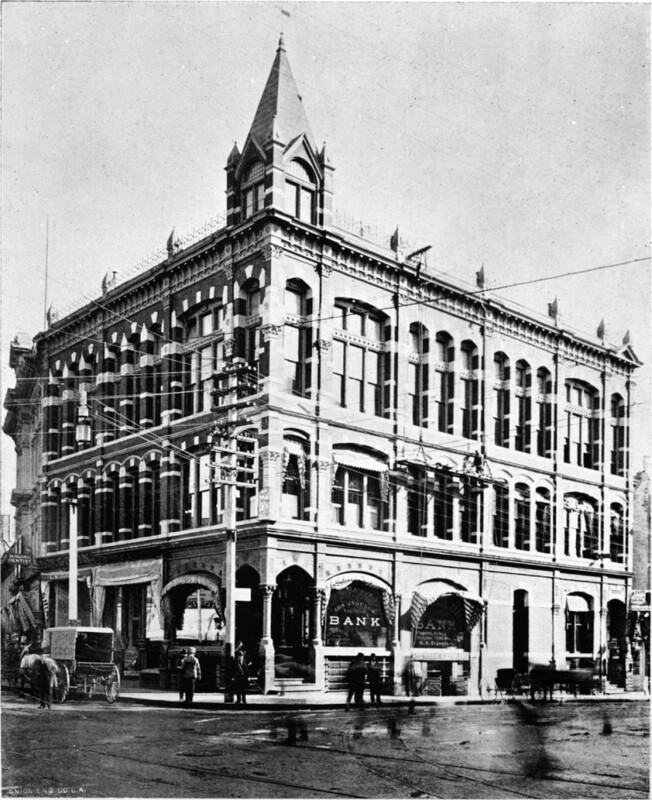 1881-1886)* - Exterior view of the first building of the Los Angeles Daily Times and Weekly Mirror, which was located at Temple and New High Streets from 1881 to 1886. Signs on the building indicate "Mirror Printing Office" and "Mirror Book Bindery." The Los Angeles Times was first published on December 4, 1881, under the name of the Los Angeles Daily Times. When the original founders ran into financial problems the following year, the fledgling paper was inherited by its printer, the Mirror Printing Office and Book Bindery. The company hired as editor former military officer Harrison Gray Otis, who quickly turned the paper into a financial success. (ca. 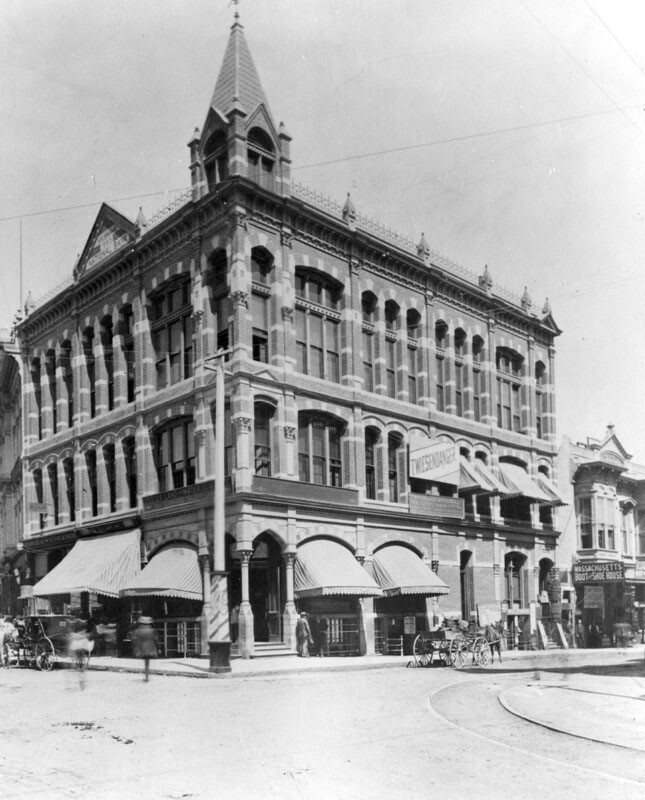 1887)* - Exterior view of the Los Angeles Times Building (built in 1886) on the northeast corner of 1st and Broadway. 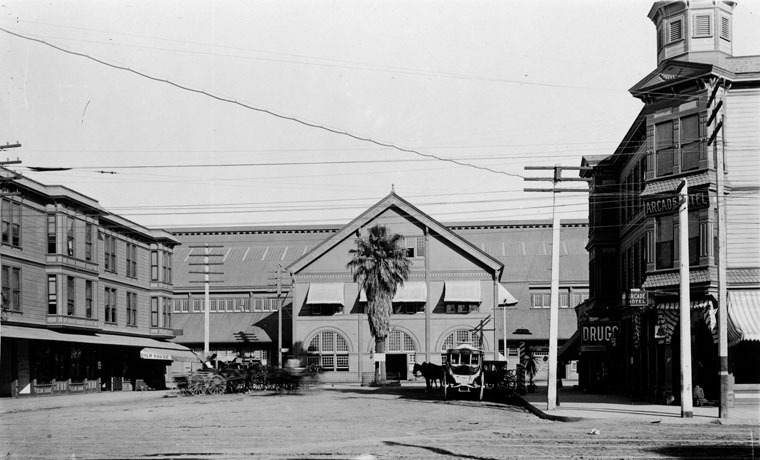 The building next door, to the right, was occupied by the Los Angeles Chamber of Commerce from February 1889 until March 1890. Harrison Gray Otis was known for his conservative political views, which were reflected in the paper. 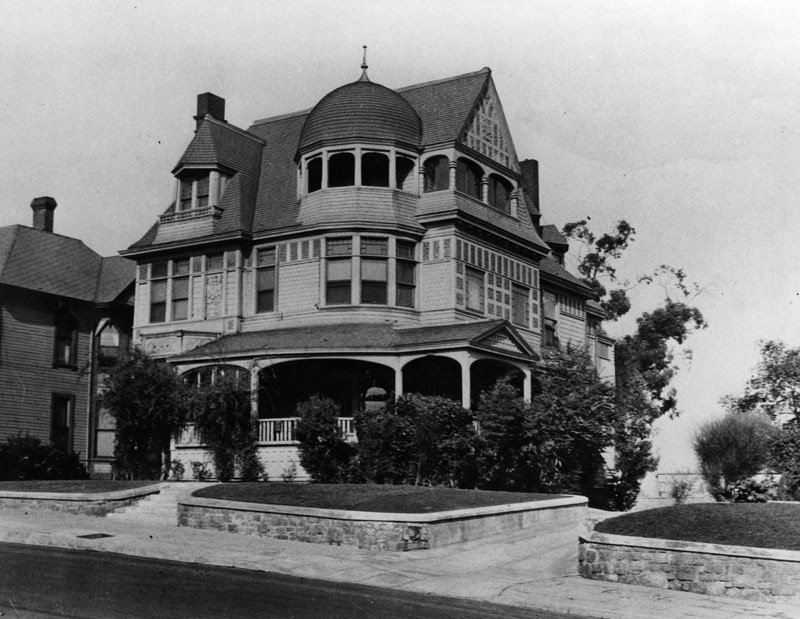 His home was one of three buildings that were targeted in the 1910 Los Angeles Times bombing. During his time as publisher of the Times Otis is known for coining the phrase "You are either with me, or against me." (ca. 1888)* - Panoramic view looking east on an unpaved 1st Street from near Hill Street. 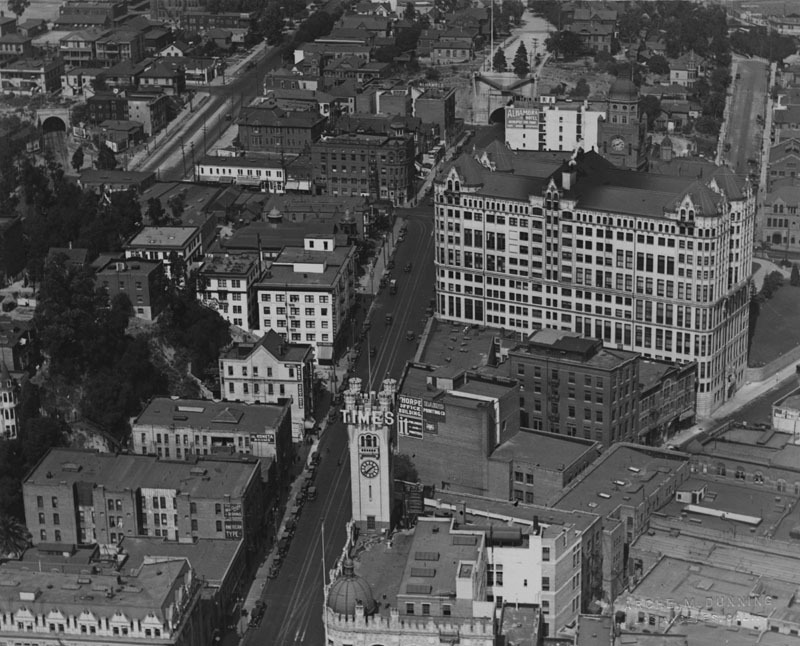 The LA Times Building can be seen at center of photo on northeast corner of 1st and Broadway. (ca. 1887)* - Carriers of the Los Angeles Times assembled in the street outside the old building on 1st and Broadway. 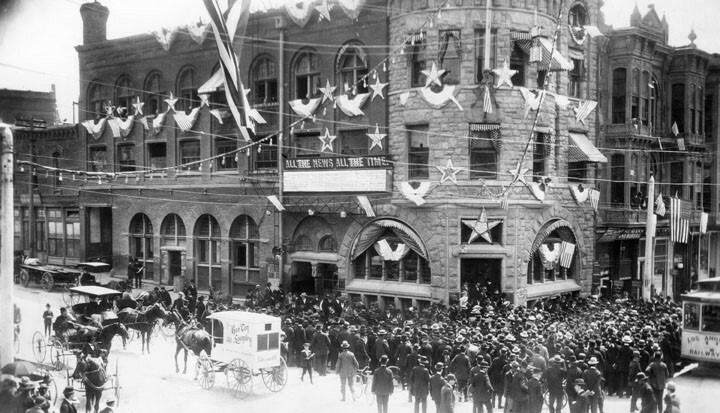 (1890s)* - View of the Times Building on the northeast corner of 1st and Broadway, decorated with stars, American flags, and other items. A large group of people is assembled by the front entrance. Horse-drawn wagons and a streetcar can also be seen. (ca. 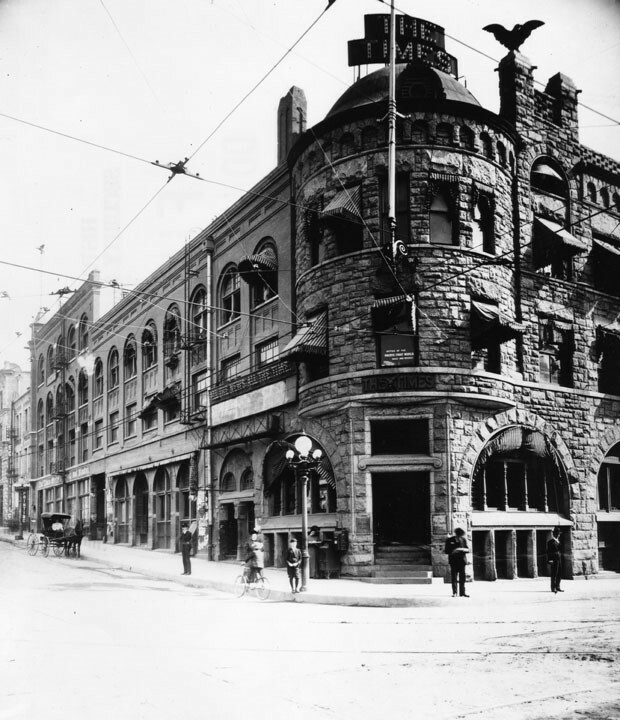 1905)^ - View looking at the north side of 1st Street showing the three-story stone Los Angeles Times Building (built in 1886), N/E corner of First Street and Broadway. Next door is a rooming house above store fronts. About fifteen pedestrians are on the sidewalk. Two horse-drawn carriages are in the street. Legible signs include: "The Times", "Furnished Rooms", "Sells Everything - The Ark, 231", "The American Café”. (ca. 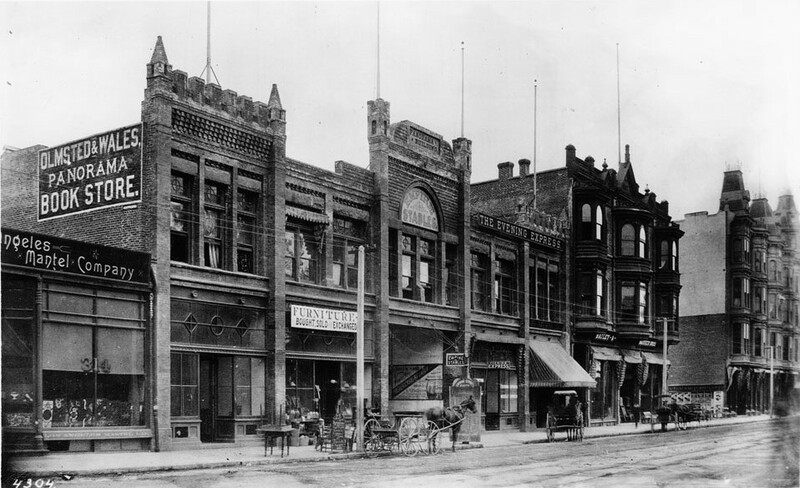 1905)* - Located on 1st and Broadway since 1886, this is how the second Times Building looked prior to the 1910 dynamiting. The Times was originally located on Temple and New High Streets. 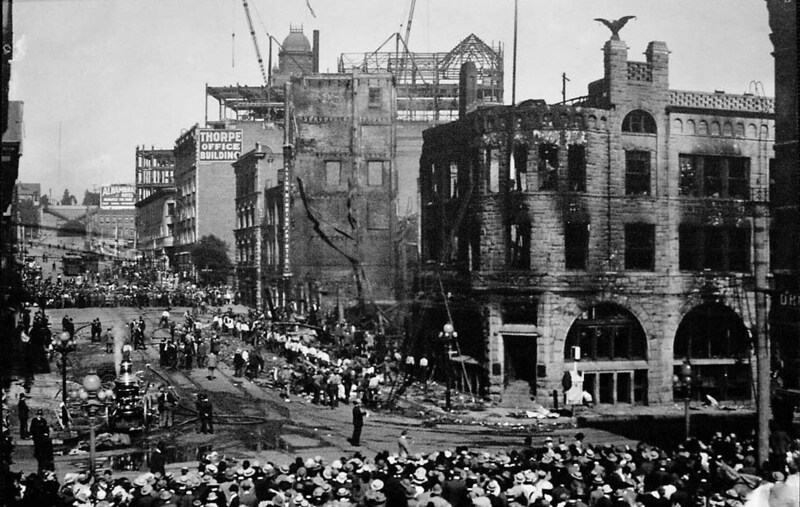 (1910)* - Bombed-out building of the Los Angeles Times at First Street and Broadway. 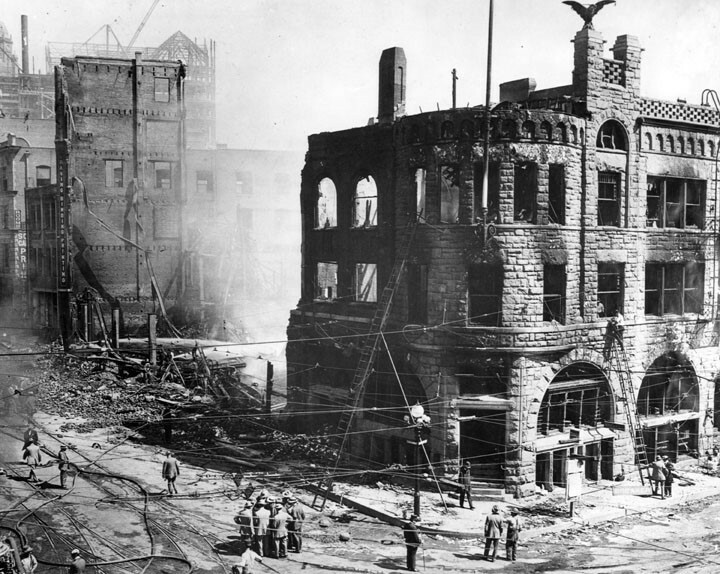 (1910)^*# - Panoramic view showing the aftermath of the Times Building bombing. (ca. 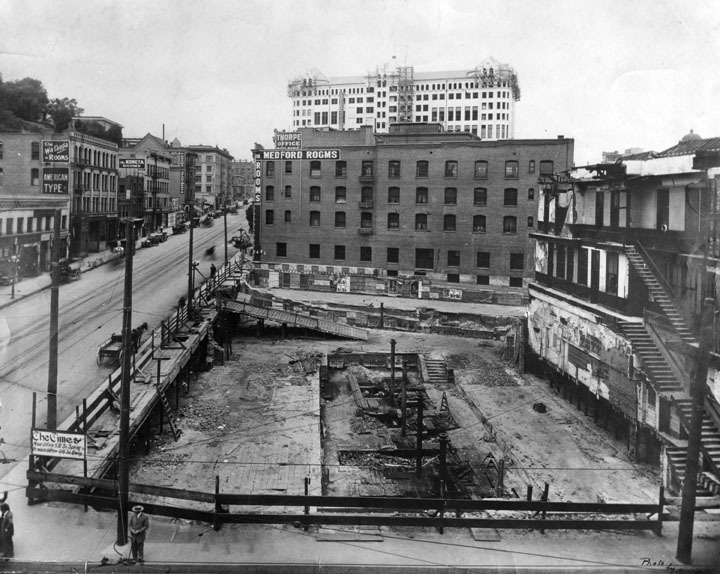 1911)* - Cleared site at the N/E corner of First Street and Broadway after the October 1, 1910 bombing of the Los Angeles Times Building. (ca. 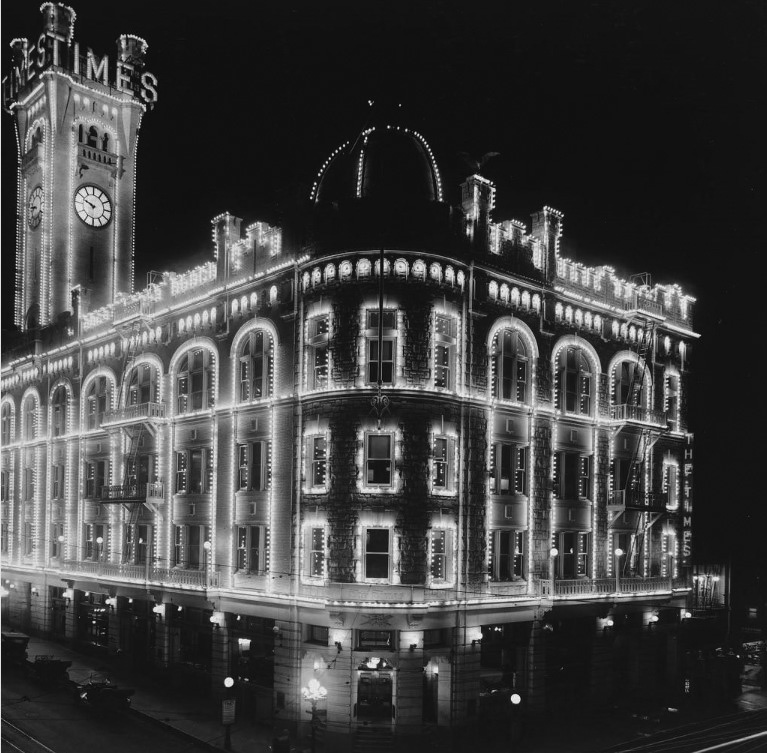 1912)* - View of the new Times Building shortly after it was rebuilt. Note the new castle-like clock tower. (ca. 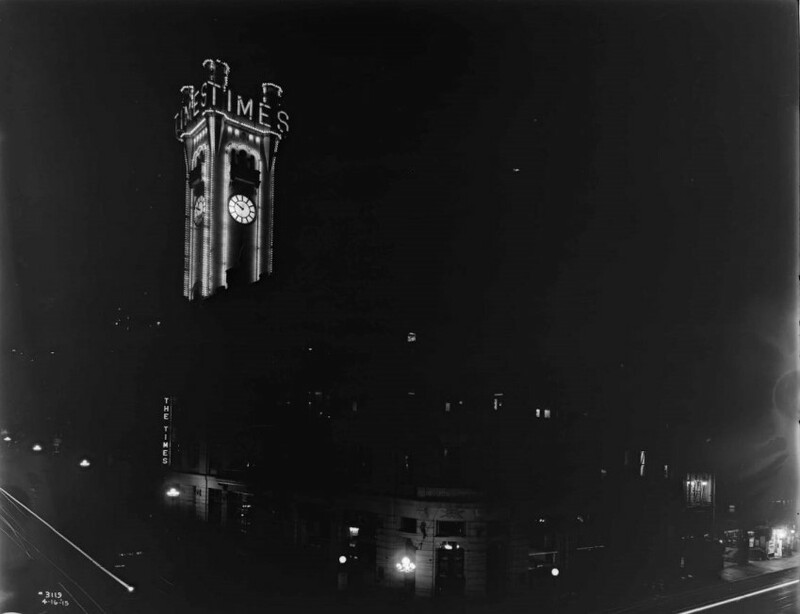 1912)^*# – View showing the newly constructed LA Times Building adorned with decorative lighting. (ca. 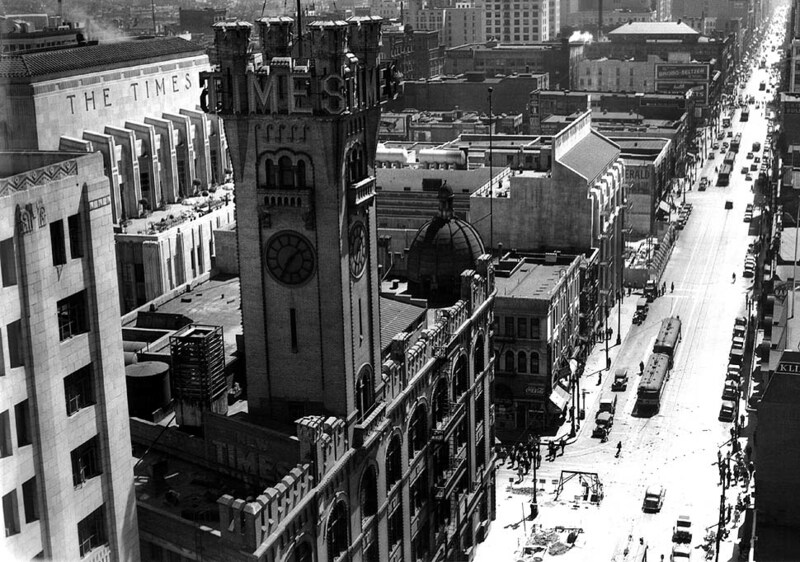 1925)* - Panoramic view of the Civic Center in the 1920s, looking north from First and Broadway, with the old Los Angeles Times building in the foreground and the Hall of Records, the old County Courthouse, and the Broadway Tunnel beyond. 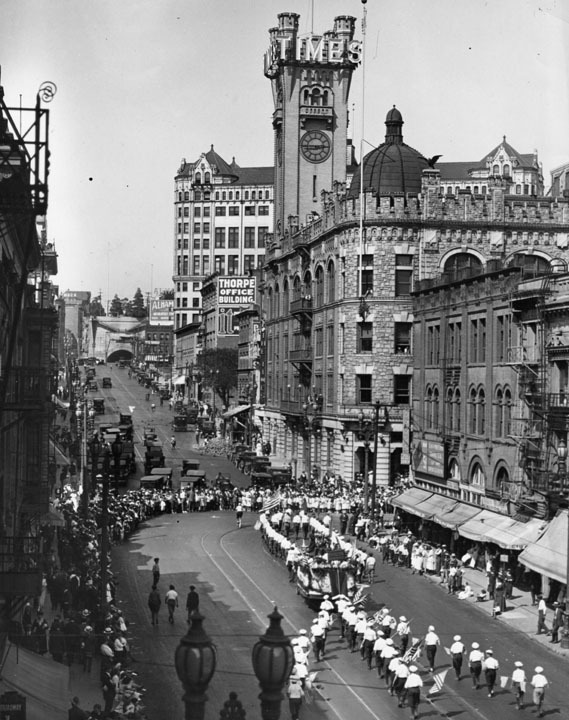 (1920s)* - View looking north showing a parade on Broadway rounding the corner at 1st Street and then heading east. The LA Times building stands on the northeast corner. In view is the Broadway Tunnel and the Hall of Records. (1926)* - View looking toward the LA Times Building on 1st and Broadway. Cars, streetcars and pedestrians are seen at the busy intersection. 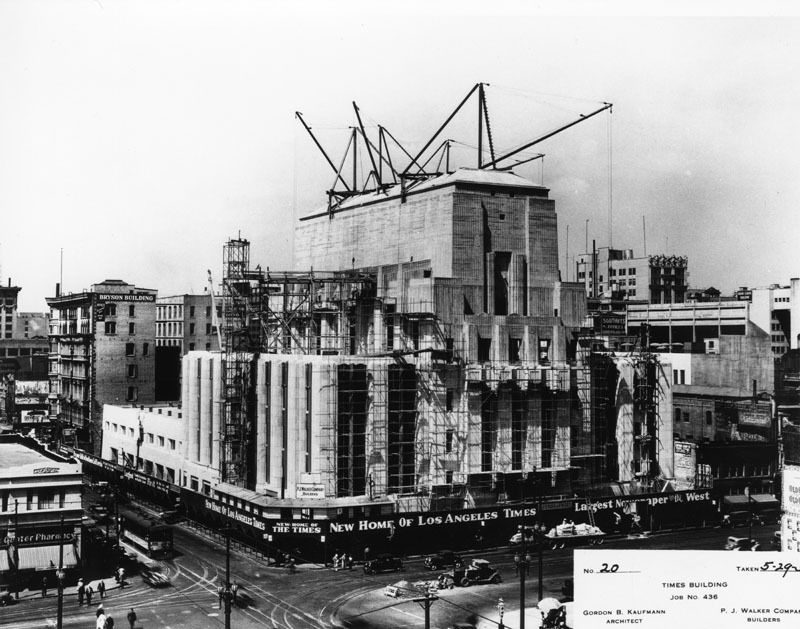 (1934)* - Scaffolding covers portions of the emerging L.A. Times Buildings as cranes clamp to the top like stick insects. 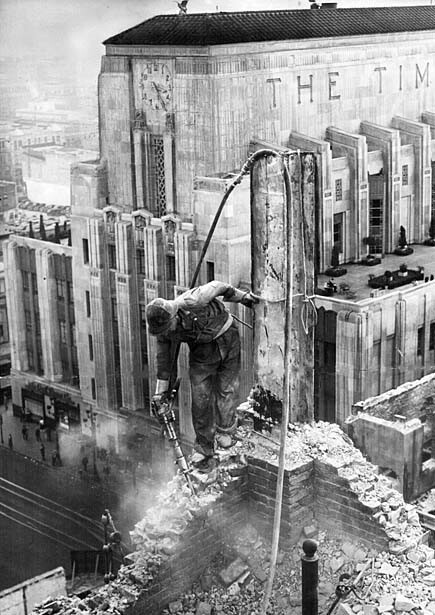 The construction fence advertises "New Home of Los Angeles Times - largest newspaper in the West". A truck delivering construction material is parked by the curb and a ladder extends from the truck to the top of the fence. Next to the Times is the Bryson Building, left. A pharmacy is across the street. (1934)^*# - View looking south on Broadway at 1st Street. The old Times Building (3rd Times Bldg.) 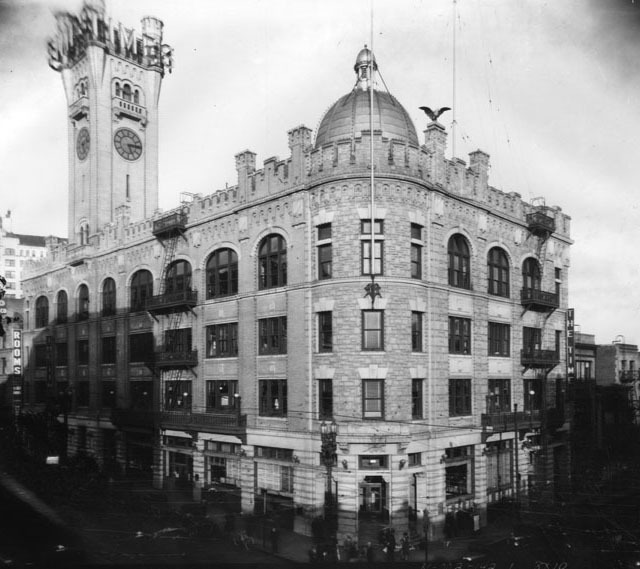 with its ornate castle-like tower stands guard while the new Times Building on First and Spring is still under construction. The new building was completed in 1935. (1937)^#*^ - The current Times Building rises behind a worker demolishing the paper's previous home. 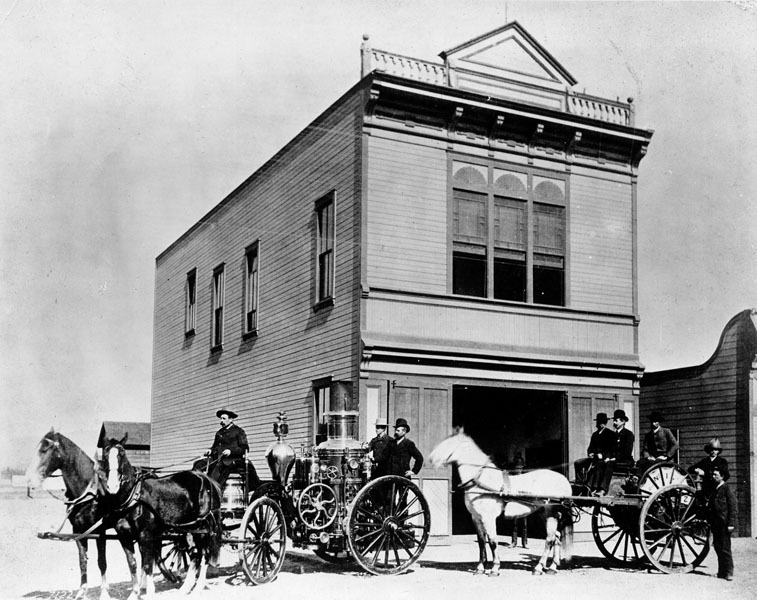 (1887)* - Horse-drawn fire engine and cart in front of Los Angeles fire station house at southwest corner of 9th and Spring streets. Notice all the men above are in street clothes. The firehouses were staffed by volunteers until the end of 1887. In December 1885, the City Council considered the merits of a fully paid Department and moved to finance and control the first fully paid, official Los Angeles Fire Department (LAFD). In February 1886, the LAFD officially went into service with four fire stations. 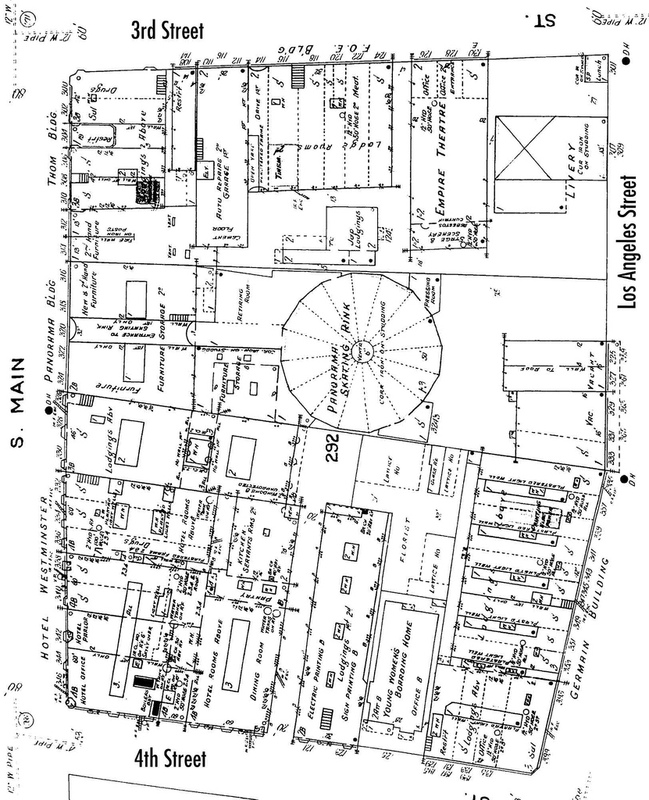 Click HERE to see more on the Old Plaza Firehouse in Early Plaza of Los Angeles. 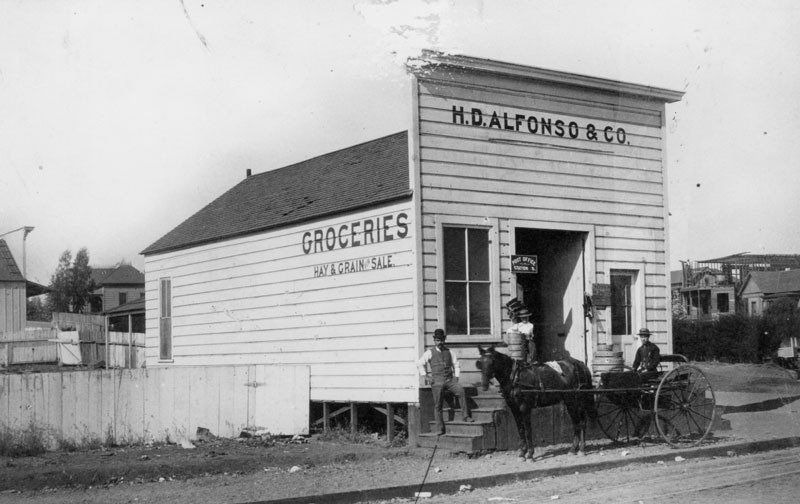 (1887)* - Exterior view of H. D. Alfonso & Co. grocery and feed store at the corner of Temple and Main. The unattached one-story wooden frame building has steps leading to the entrance. A sign at the door indicates that the premise is authorized to be a post office station. 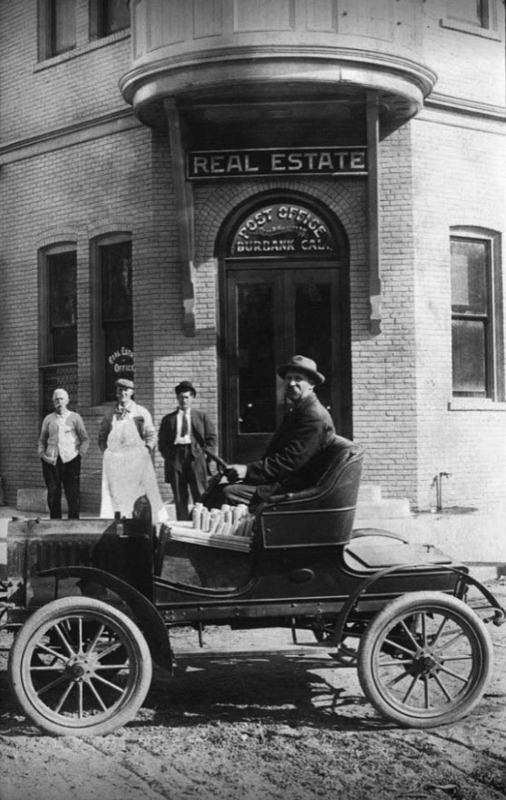 A man and boy pose on the steps and a man in a horse and buggy are in front. On the side of the building is painted: "Groceries, Hay and Grain for sale". A house is being constructed in the background. 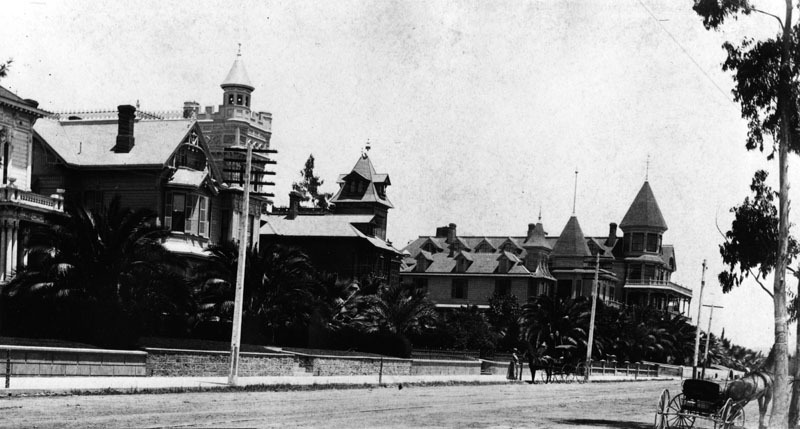 (1887)^*^^ - View of the Burbank Villa Hotel looking north on Olive Avenue. It was built by Dr. David Burbank and his son-in-law John W. Griffin. Behind it and to the right is the Burbank Block. 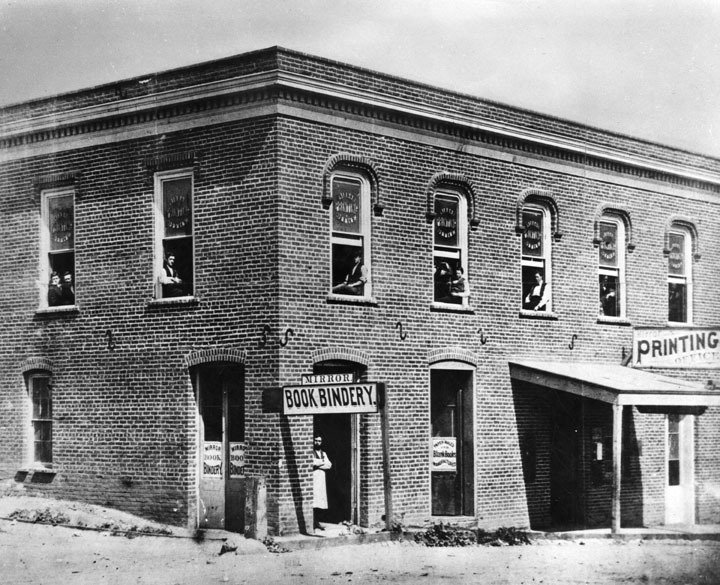 (1895)* - Exterior view of the Burbank Block (Brick Block), the first brick building in town located at San Fernando Road and Olive Avenue. Horse-drawn carriages are parked alongside of the building. (1889)* - Group photo of several men sitting in front of the Burbank Block. The Burbank Block was the first brick building in town, located on San Fernando Road (now Golden Mall) and Olive Avenue in Burbank. The Brick Block was erected during 1887 by the Provedencia Land & Water Co. for the newly planted town of Burbank. (1911)^.^ – Four men pose for the camera in front of the Burbank Post Office located in the Brick Block Building. Sign over the doorway also reads “Real Estate”. Note the early model car has the steering wheel on the right..
(ca. 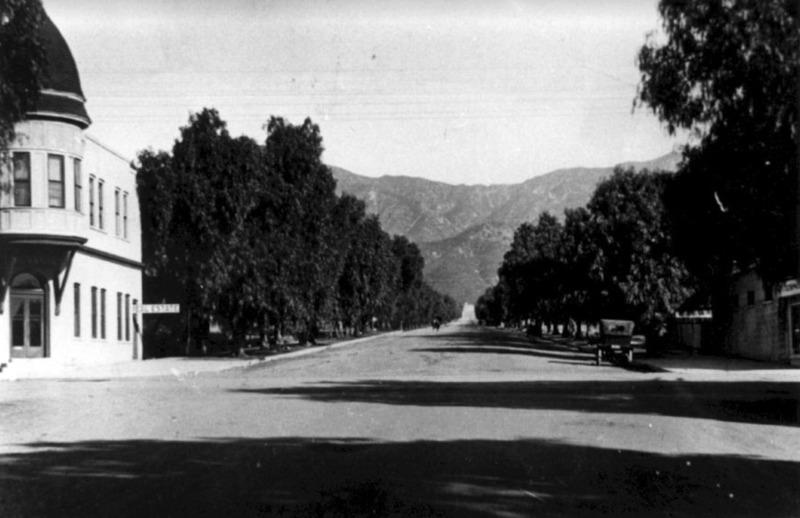 1915)^.^ - View looking north on Olive Avenue from San Fernando Road towards the Verdugo Mountains with the Brick Block Building seen on the left. 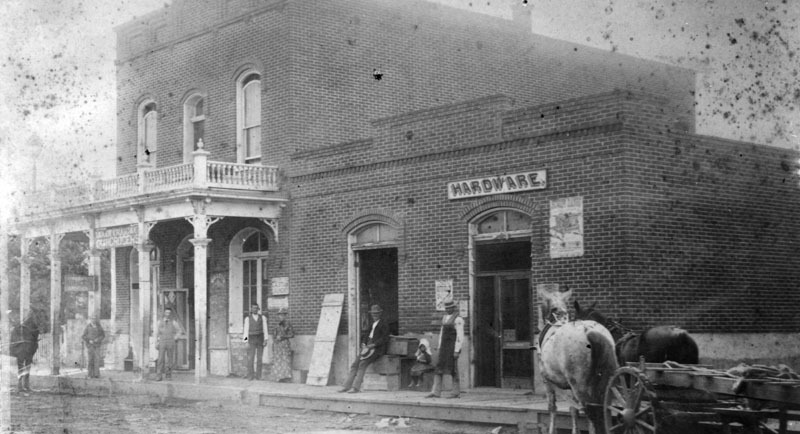 (1887)* - This business block in Compton includes a hardware and grocer. A horse-drawn cart can be seen at right. Shop owners are standing in front of the brick building housing various businesses, posing for the camera. In 1867, Griffith Dickenson Compton led a group of thirty pioneers to the area. These families had traveled by wagon train south from Stockton, California in search of ways to earn a living other than in the rapid exhaustion of gold fields. Originally named Gibsonville, after one of the tract owners, it was later called Comptonville. However, to avoid confusion with the Comptonville located in Yuba County, the name was shortened to Compton. Click HERE to see more Early Views of Compton. ca. (1880)^ - Full frame lithograph photo of the orange and lemon groves on the Wolfskill Ranch, residence of William Wolfskill. The Los Angeles and Independence Railroad Station can be seen in the background. 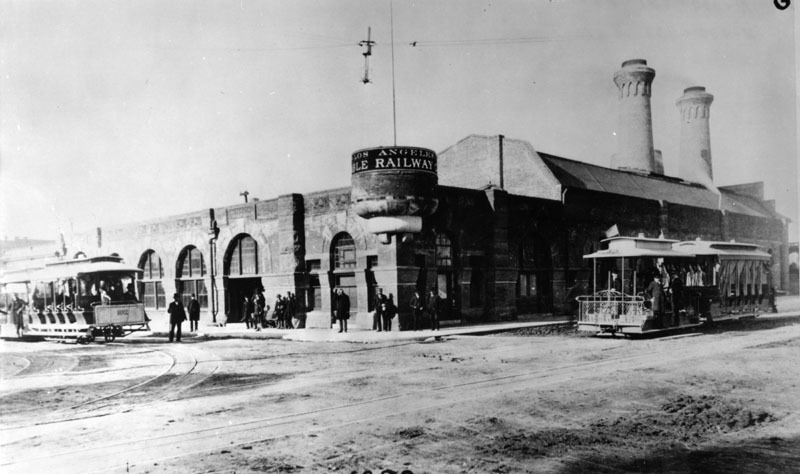 The Southern Pacific Arcade Station would be built on the Wolfskill Ranch in 1888. William Wolfskill, a native of Kentucky, came to California in 1831 and settled in Los Angeles in 1836, where he soon met and married Magdalena Lugo, daughter of Jose Ygnacio Lugo. In March 1838, Wolfskill purchased a 100-acre lot bounded by 3rd to 9th streets and San Pedro to Alameda streets, which he named Wolfskill Ranch, and built a large adobe (known as "Wolfskill Adobe") located at 239 Alameda, between 3rd and 4th streets. In 1839 Wolfskill became a major grape producer when he planted the first vineyard of table grapes in California. Two years later, in 1841, he planted his first 2-acre plot of citrus behind his adobe, between 4th and 6th streets east of Alameda. In a short period of time, Wolfskill's farm had increased to 28-acres of planted citrus with over 2,500 orange trees. By 1862 he owned 3/4 of all the orange trees in California and was the biggest orange grower in the United States - for which he is considered the father of early California citrus industry. (ca. 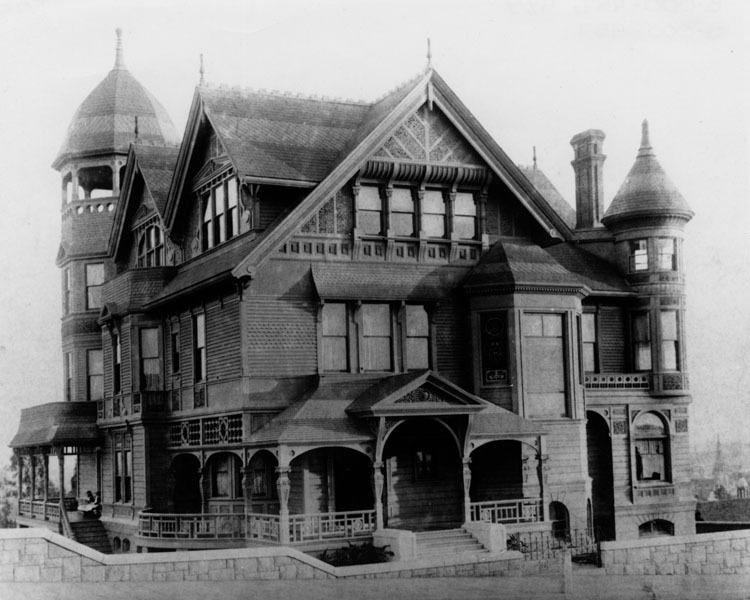 1880s)* - Exterior view of the William Wolfskill adobe (simply known as the "Wolfskill Adobe") located at 239 Alameda, between 3rd and 4th streets. 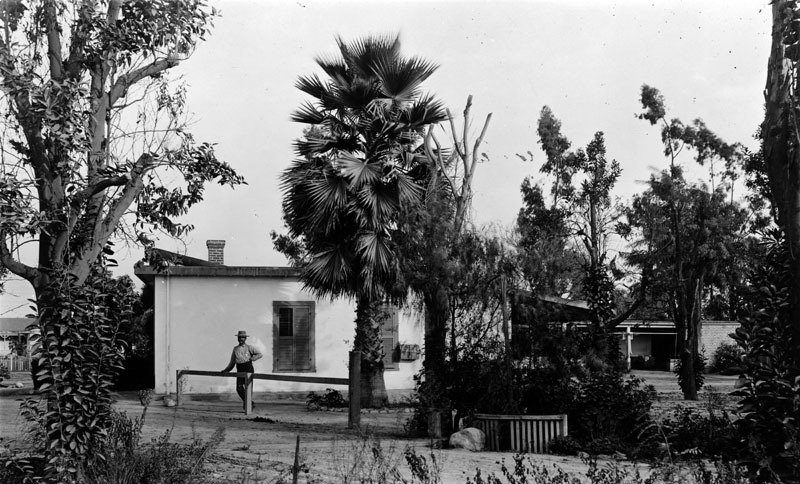 It shows one side of the white L-shaped adobe behind several palms and trees. A gentleman can be seen leaning against a low post - possibly used to tie horses, as a pile of manure is visible near his feet. 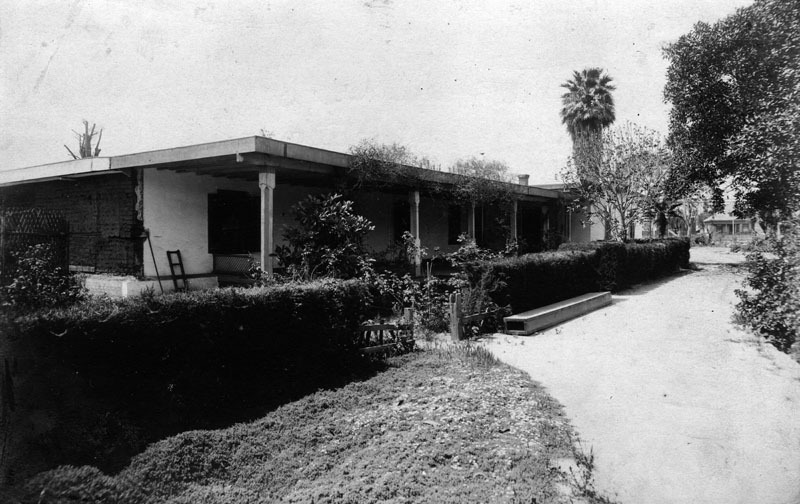 John Wolfskill, William's younger brother, owned the Wolfskill Ranch on land that would later become Westwood and UCLA. 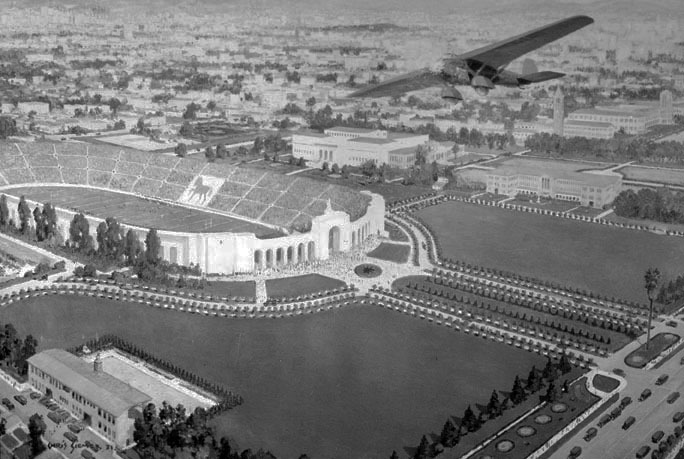 Click HERE to see more in Early Views of UCLA. (1887)* - Front view of the Wolfskill Adobe showing a low hedge separating the house from a dirt pathway, possibly a driveway. A few trees can be seen in the surrounding area and another house or building is visible in the background on the right. 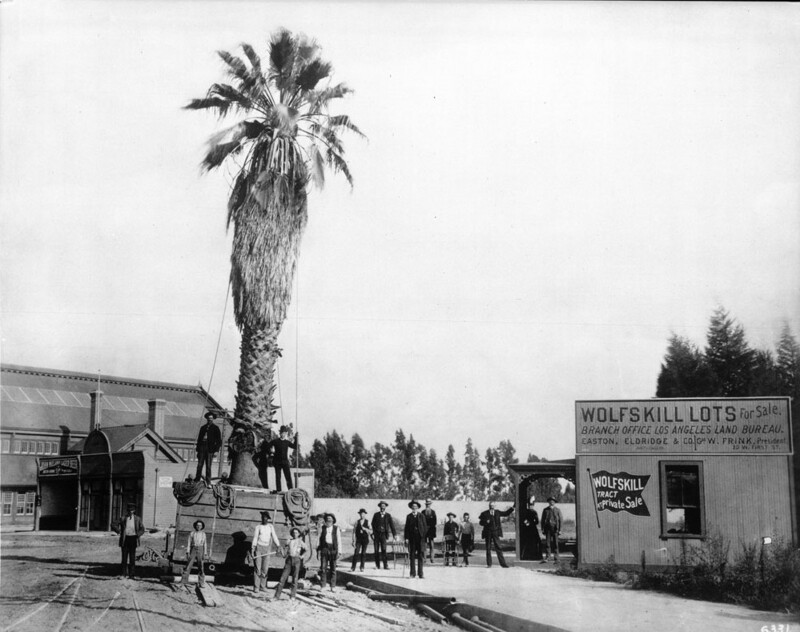 (1889)^^* - View of a palm tree being moved to the front of the recently completed Arcade Depot on Fourth Street and Alameda on land that was once occupied by the Wolfskill Adobe. Amazingly, the original Arcade Depot palm seen above is still alive. It was replanted at a location in front of the Los Angeles Coliseum where it stands today. It along with the Longstreet Palms are considered to be the oldest trees in the City of Los Angeles (see more below). 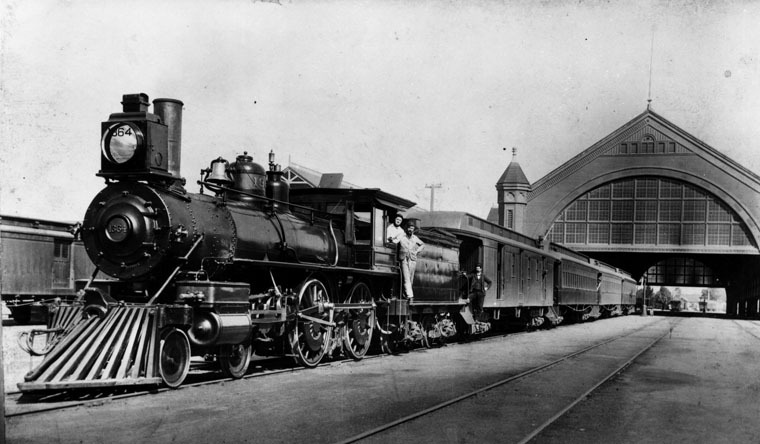 (1891)* - Southern Pacific steam engine no. 1364 heads the train at the Arcade Station at Alameda between 4th and 5th St. 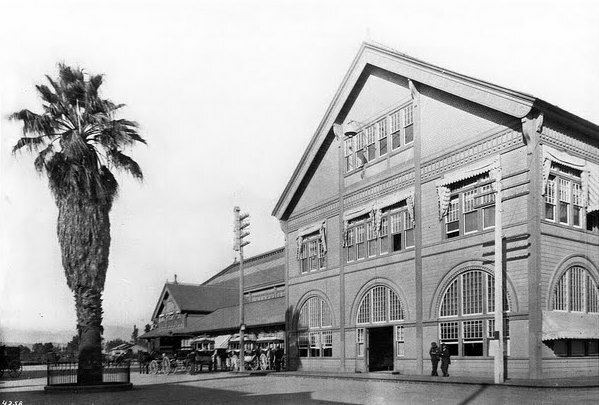 The Arcade Station was the second station built by Southern Pacific in Los Angeles (and first one built primarily for passenger service). Built in 1889 and used until 1914 when it was replaced by larger SP Central Station. It was demolished shortly thereafter. 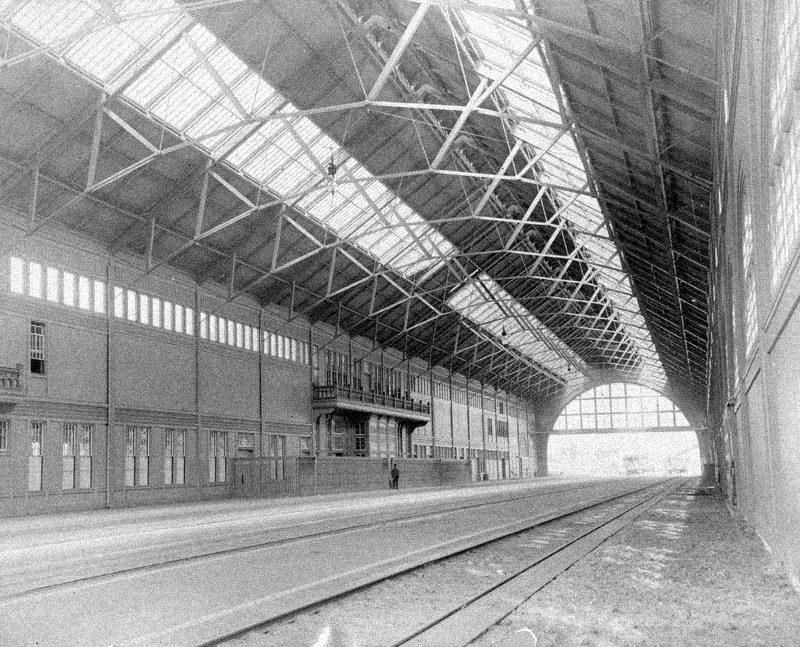 (n.d.)* - Interior view of an empty Arcade Depot. The trains appear to be sitting outside the building. (ca. 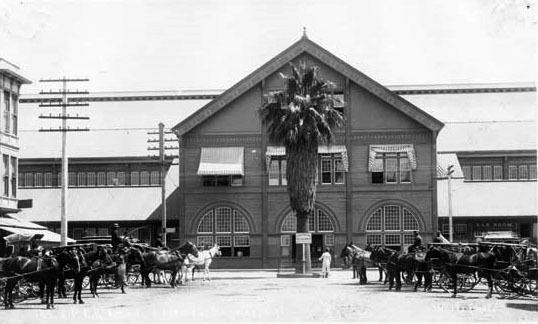 1890)^## - View showing over a dozen horse-drawn wagons waiting for the next train to arrive at the Southern Pacific Arcade Depot. 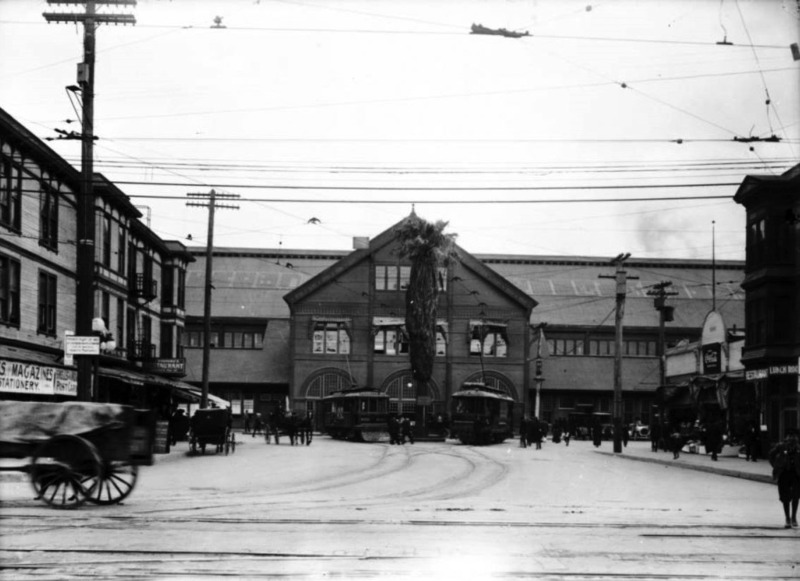 (1896)^## – Close-up view of the large palm tree standing in front of the Arcade Depot. Horse-drawn wagons are parked in front of the station. (1908)^^* - Close-up view of the Arcade Depot with it's now-famous palm tree standing tall in front of the main entrance. Horse-drawn carriages can be seen waiting for the arrival of passengers. (ca. 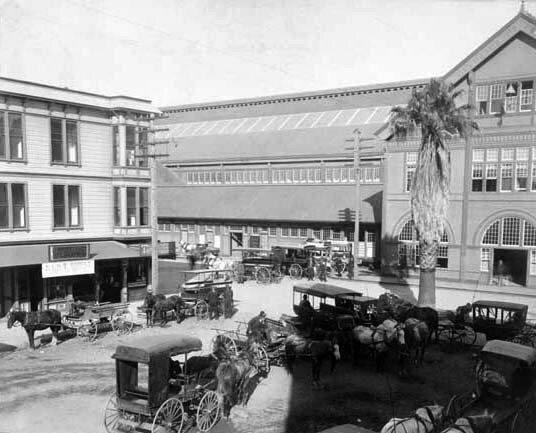 1908)* - Horse and buggies are parked outside the Arcade Station on the east side of Central Avenue at the end 5th Street. 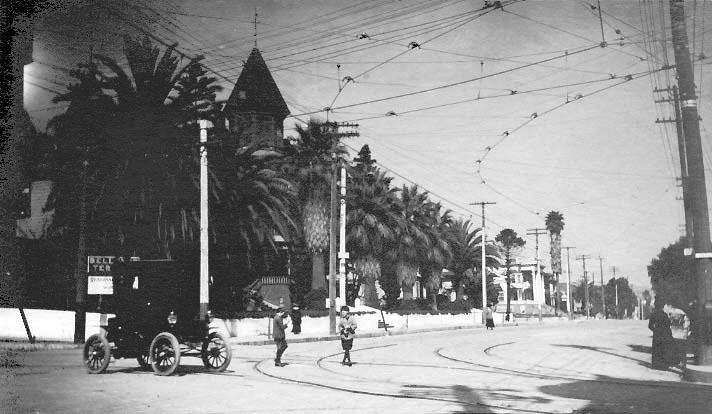 The singular Arcade palm tree can be seen in front of the station, the same tree seen being planted in the earlier 1889 photo. (ca. 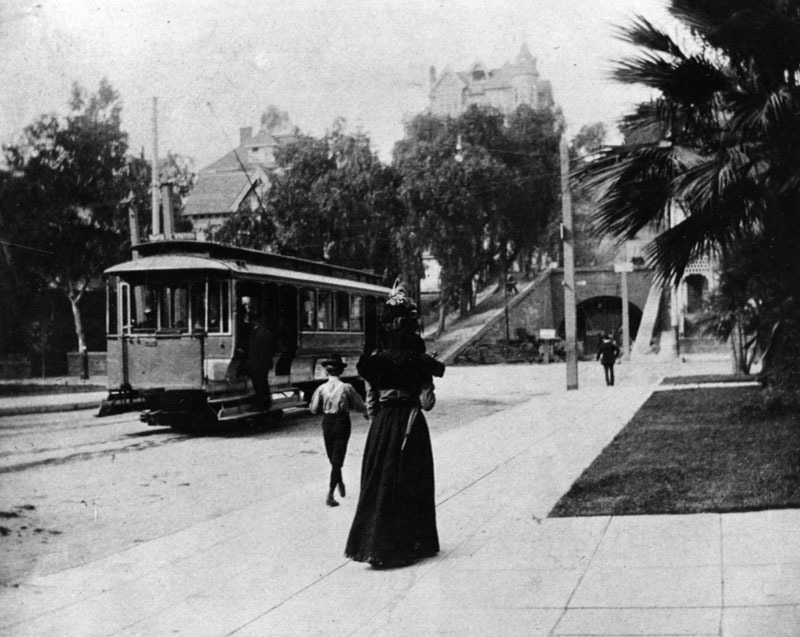 1895)* - View showing the first streetcar on the L.A. Consolidated Electric R.R. in front of Southern Pacific's Arcade Station. (ca. 1914)^^* - View looking east on Fifth Street as it ends at the Southern Pacific Railroad Arcade Depot. Two streetcars are parked in front of the railroad building on tracks that intersect with more tracks in the foreground. Several horse-drawn vehicles are visible, as well as many pedestrians making their way along the sidewalks that border the streets. The ‘Arcade Depot Palm’ is seen standing near the center of the building. (ca. 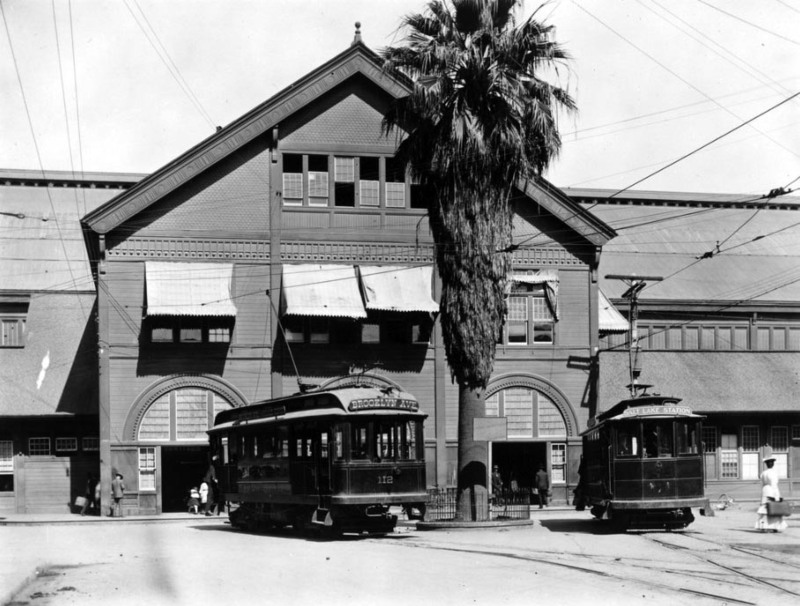 1905)*#*# – View showing two Pacific Electric Railway cars parked in front of the Arcade Depot. Sign above the two streetcars read Brooklyn Ave and Westlake Station, respectively. (ca. 1930s)* - A painting by Chris Siemer of the Los Angeles Coliseum in Exposition Park around the 1930s, created for a display for the Los Angeles Chamber of Commerce. The horse created by the card section indicates that a USC football game is in progress. On the lower right side, at the Figueroa St. entrance to Exposition Park, stands the Arcade Palm. 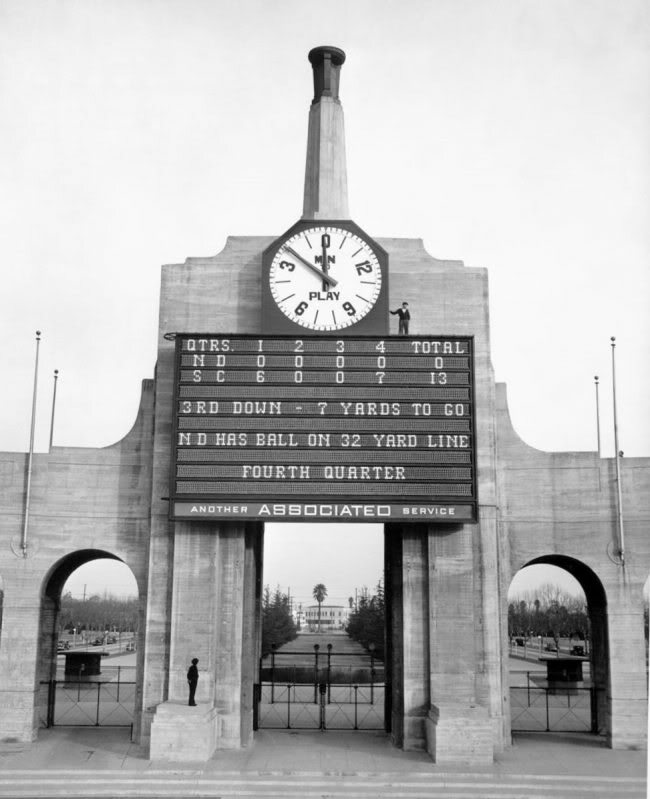 (1932)^*# - View looking east at the LA Coliseum scoreboard during a USC - Nortre Dame game. The Arcade Depot Palm is seen through the arch of the colonnade. Final score: USC 13 - Notre Dame 0: USC shut out Notre Dame on its way to a second consecutive consensus national title, matching Notre Dame's feat in 1929 and 1930. From 1928-1932, USC and Notre Dame combined to win the national title five straight years, with USC winning in 1928, 1931 and 1932, and Notre Dame winning in 1929 and 1930. 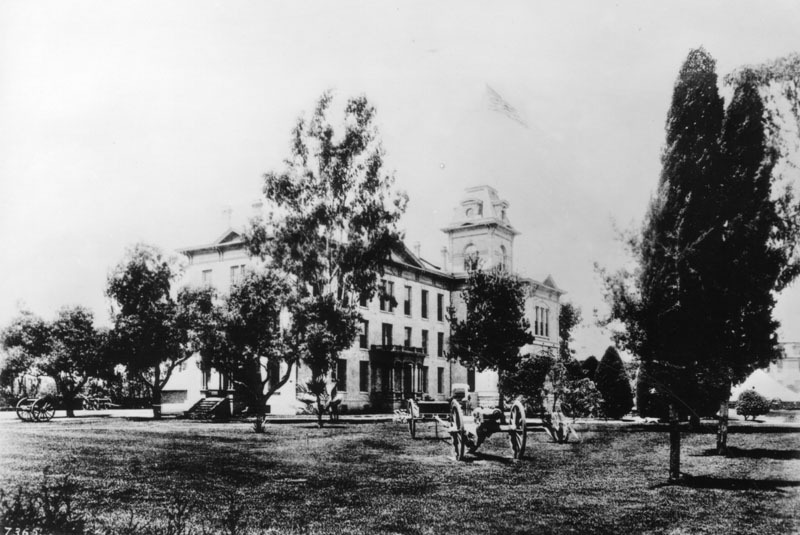 Click HERE to see more in Early Views of USC. (2018)^.^ - View looking west toward the LA Memorial Coliseum in front of the Arcade Depot Palm and commemorative plaque. Click HERE for another contemporary view. 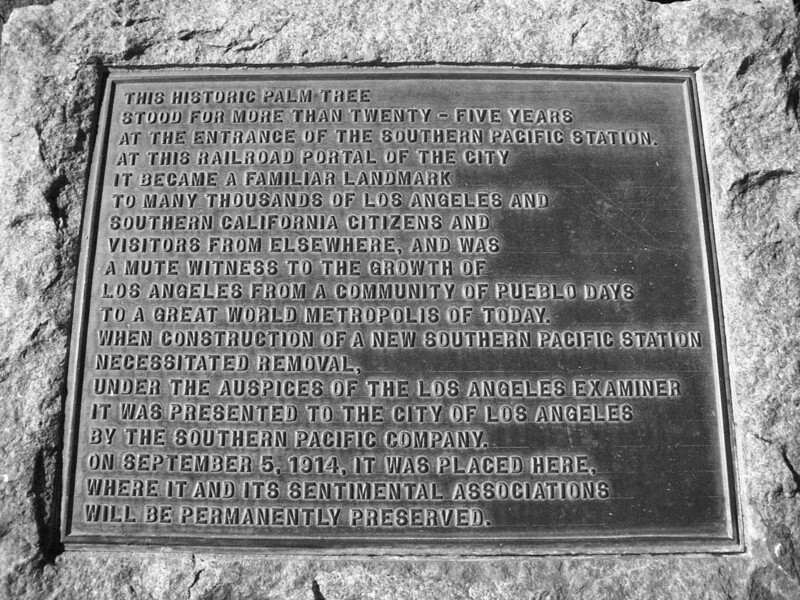 (n.d.)#*#* - Plaque commemorating the Arcade Depot Palm as the "Mute witness to the growth of Los Angeles". 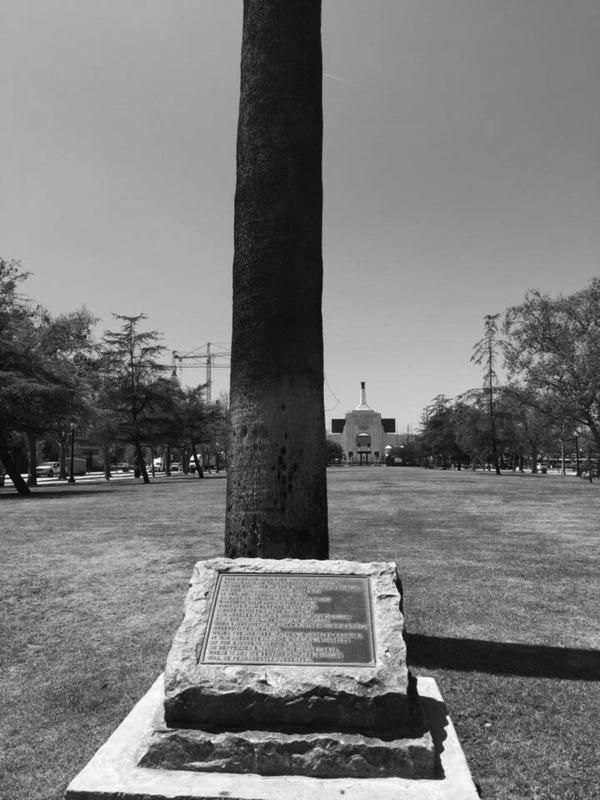 Both plaque and Arcade Palm are situated in front of the LA Memorial Coliseum. (ca. 1887)* - View of Fort Moore Hill, showing the home (upper center) of Mary Hollister Banning, widow of General Phineas Banning. The structure was built by Jacob Philippi as a beer hall, but Banning purchased and transformed it into a home. Part of the trenches of old Fort Moore, built in 1846-1847, are visible in the upper left. 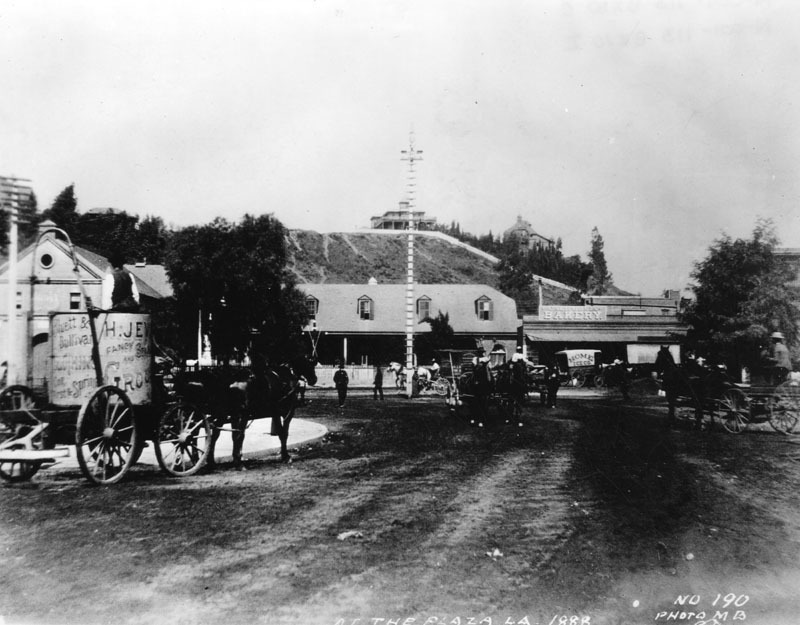 (1888)* - Horses and buggies at the Los Angeles Plaza in 1888. 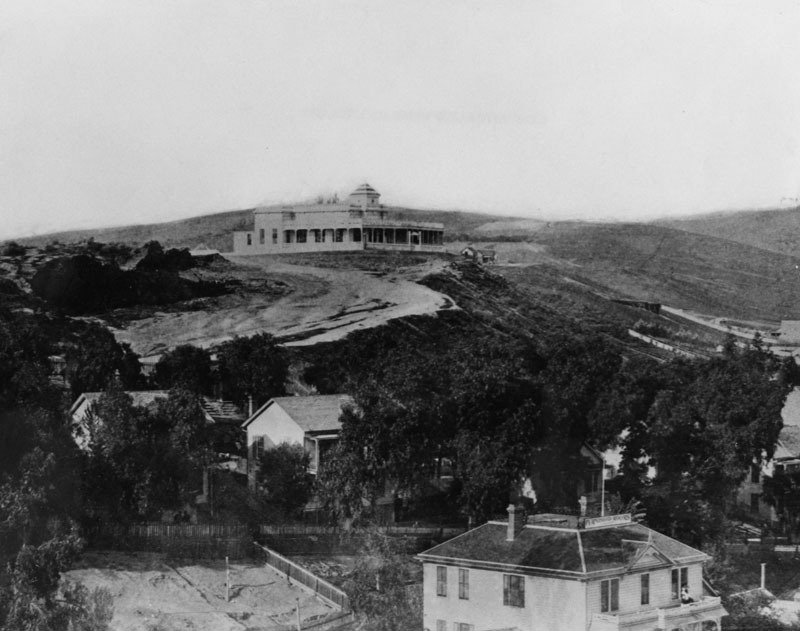 The Banning Residence can be seen in the background on top of Fort Moore Hill overlooking the LA Plaza. The LA Plaza Church is to the left. Click HERE to see more in Early Plaza of L.A.
(ca. 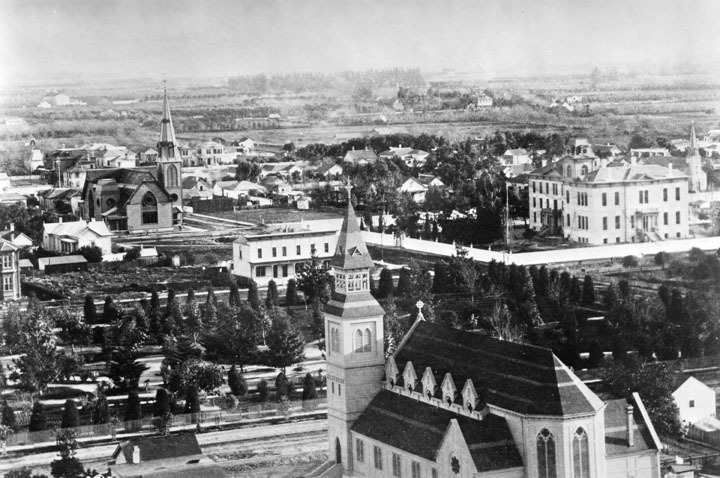 1915)^^* - View looking west from the LA Plaza showing the Old Plaza Church with the Banning House in the background on top of Fort Moore Hill. 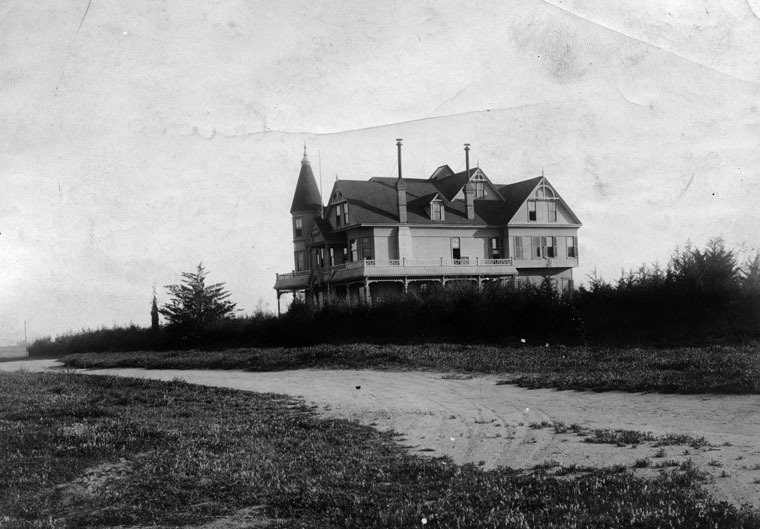 (1927)* - View of the old Banning Residence on Fort Moore Hill, seen here as a boarding house. The structure was built by Jacob Philippi as a beer hall, but later Mary Hollister Banning, widow of General Phineas Banning, transformed it into a home. (ca. 1937)* – View of the former home of Mary Hollister Banning on Fort Moore Hill. Photo by Herman Schultheis. (ca. 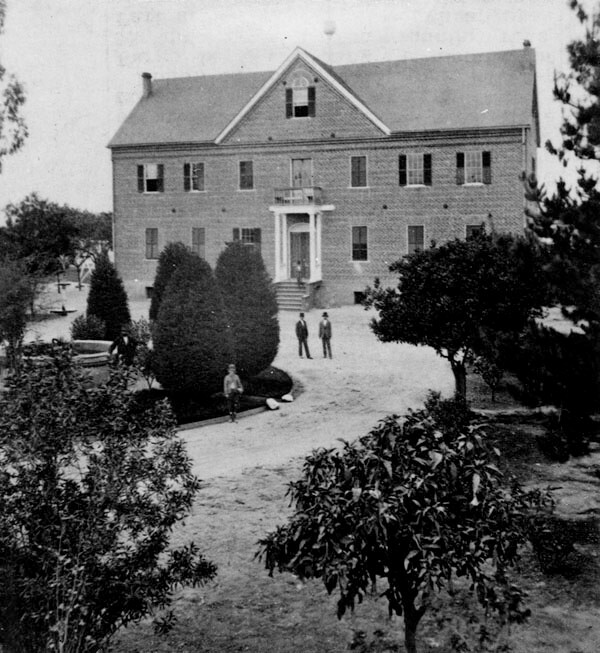 1887)^^* - Head of Vermont Avenue - Photograph of an exterior view of the old Los Feliz school in Cahuenga Valley, later Hollywood. The building is a two-story wood building with a large tower at center. The top level of the tower is an open deck, and the roof of the tower is onion-shaped. A tall flagpole stands on the roof at left and a large flag flies from it. The main entrance to the school is at left and consists of a stairway leading up to a covered porch. The windows of the school are tall and rectangular, and they are very close together at right. There is a hill in the background, and a low wooden fence is in the foreground. (ca. 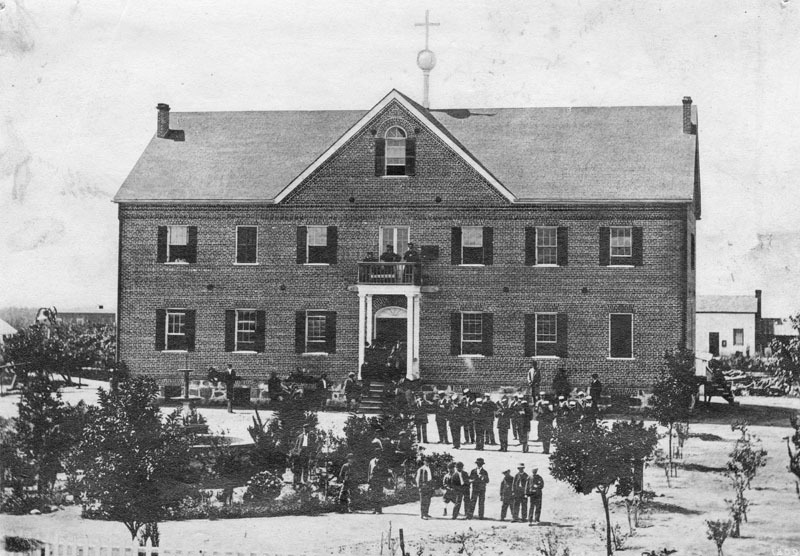 1887)* - Exterior view of Maclay School of Theology, a Methodist seminary founded by Charles Maclay, a Methodist minister, in 1885 in San Fernando. In 1874, Charles Maclay bought 56,000 acres of the Rancho Ex-Mission San Fernando land grant including the northern half of the San Fernando Valley. In 1882, cousins George K. Porter and Benjamin F. Porter, owner of future Porter Ranch, each received one-third of the total land. Click HERE to see Early Views of the San Fernando Valley or HERE to see Early Views of U.S.C. (1866)* - View of St. Vincent's College at its second location. This would evolve to become today's Loyola Marymount University (LMU). This was St. Vincent's College second location. It first started across from the LA Plaza in a building donated by Vincent Lugo. 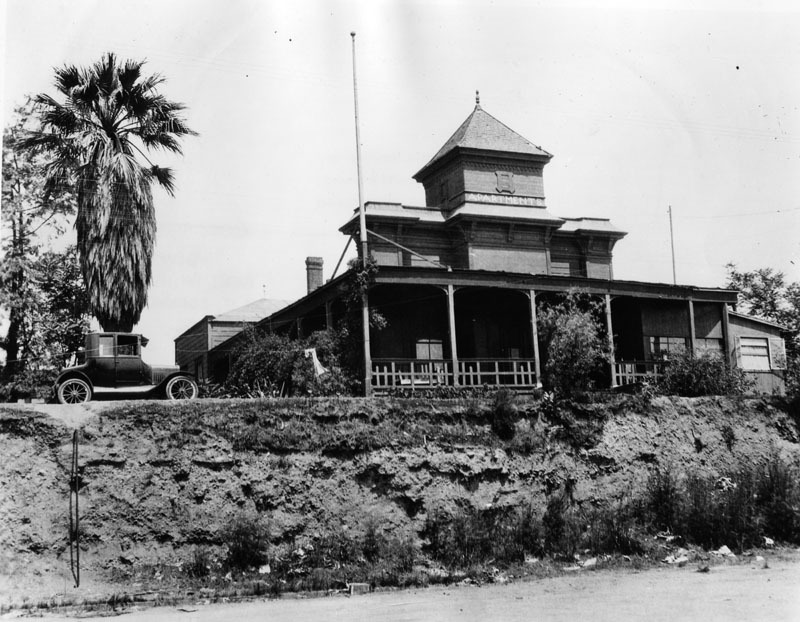 Click HERE to see St. Vincent's College original location (Vincent Lugo Adobe). (ca. 1868)* - View of St. Vincent's College, located at Hill and Broadway, between 6th and 7th streets. Numerous students, including what appears to be a band, can be seen on the grounds, which are landscaped with several trees. (ca. 1884)^ - Panoramic view of St. Vincent Park (later Pershing Square) and surrounding area looking southeast. In the foreground is St. Paul's Pro-Cathedral. St. Vincent's College is seen in the upper-right. (ca. 1887)* - View of St. Vincent's College located at Hill and Broadway, between 6th and 7th streets, showing dirt road in front of the campus. (ca. 1887)* - View of St. Vincent's College, located at Hill and Broadway, between 6th and 7th streets. It is believed that the left portion of building was erected for St. Vincent's College, and later, was the headquarters to General Miles of the U.S. Military Dept. of Arizona. St. Vincent’s Place, the site of Saint Vincent's College from 1868 to 1887 has been designated as California Historical Landmark No. 567. The college, now Loyola University, was the first institution of higher learning in Southern California. Click HERE to see more California Historical Landmarks in LA. (1889)* - Southwest headquarters of the United States Army, formly the site of Saint Vincent's College, Sixth Street and Broadway. 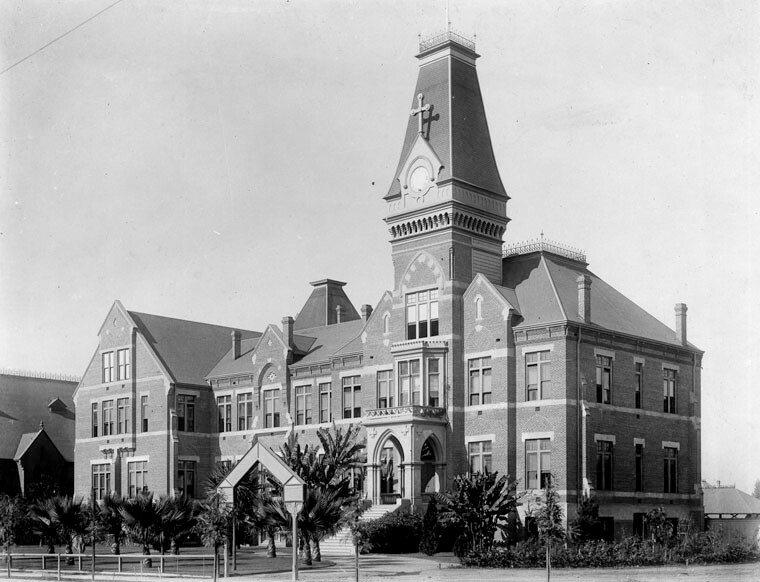 (1905)* - Front view of St. Vincent's College (now Loyola Marymount University) on South Grand Avenue, between W. 18th Street and W. Washington Boulevard. This was the third campus location. (1881)* - Photograph of the Los Angeles Infirmary, as it looked in 1881. This was the second building to house the city's finest hospital, located on Naud Street, opposite the Southern Pacific Railroad Depot. This was a three-story American Mansard-style structure with a wrap-around balcony on the second floor, and numerous windows and doors. 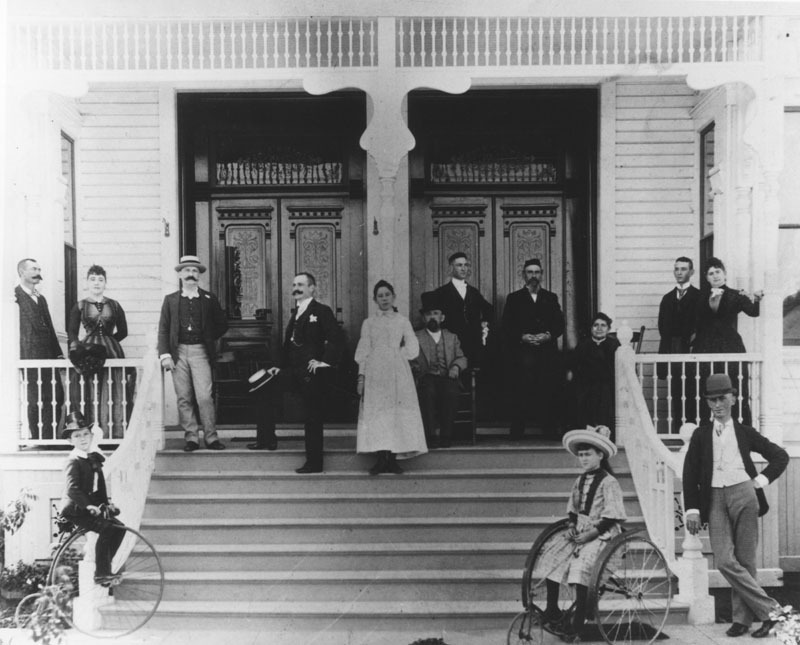 Two young girls stand next to a large shrub at the front of the hospital, and several adults stand on the balcony. The Daughters of Charity of St. Vincent de Paul established the first hospital in Los Angeles - the Los Angeles Infirmary, in 1856. It was located in the Sonora Town adobe owned by then-Mayor of Los Angeles, Don Cristóbal Aguilar. 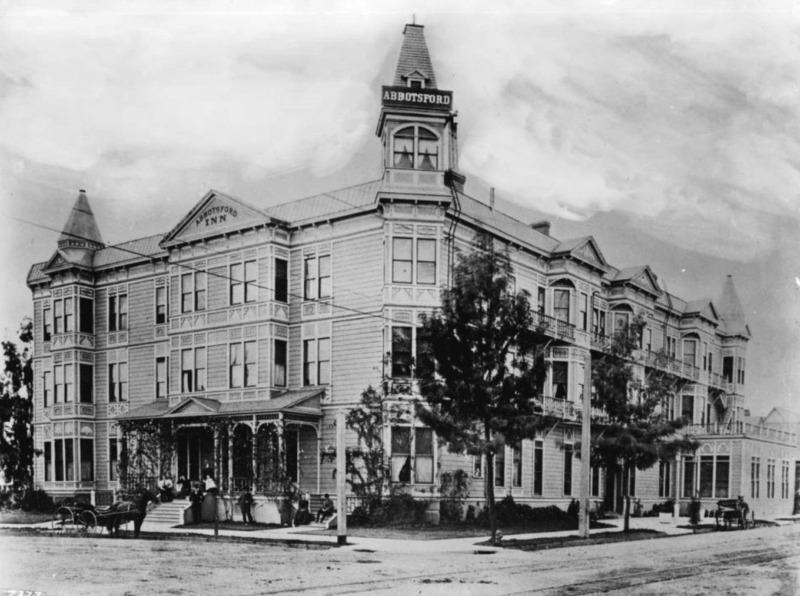 Four years later, in 1860, the hospital relocated to 1416 Naud Street, between Ann (named for Sister Ann) and Sotillo Street (though other data indicates the location was 1414 Naud Street, between N. Main and San Fernando Road). 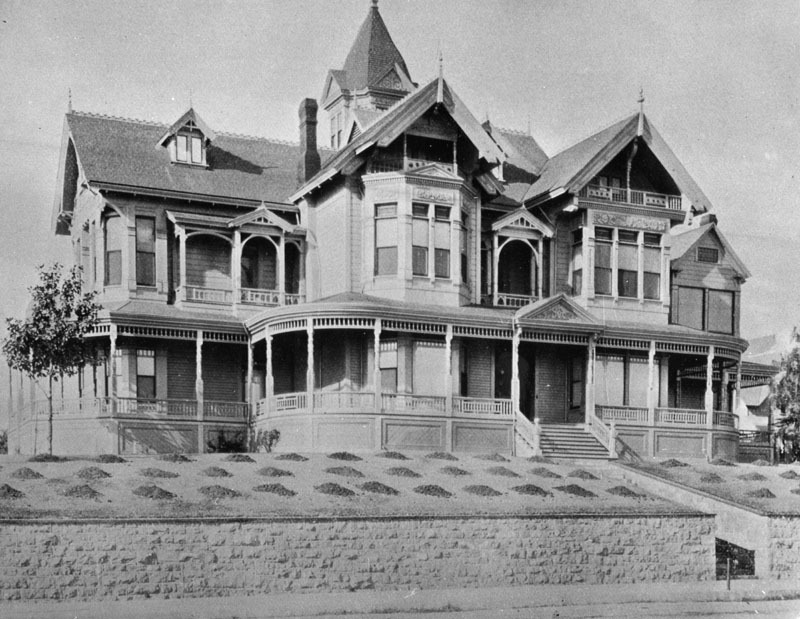 In 1869, Daughters incorporated the Los Angeles Infirmary under their own ownership, the first women in the region to do so. ca. 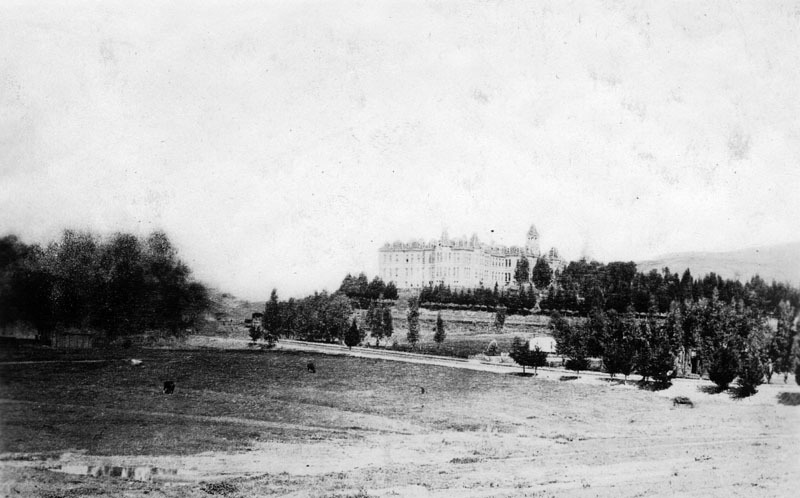 1887)* - View looking northwest showing St. Vincent's Infirmary (aka Sisters Hospital) located near Sunset Blvd and Beaudry Ave as seen from across a sparse field. Several trees can be seen to the right of the grand hospital, which boasts of numerous windows, dormers, an irregular roof, a cupola or tower, and several chimneys. 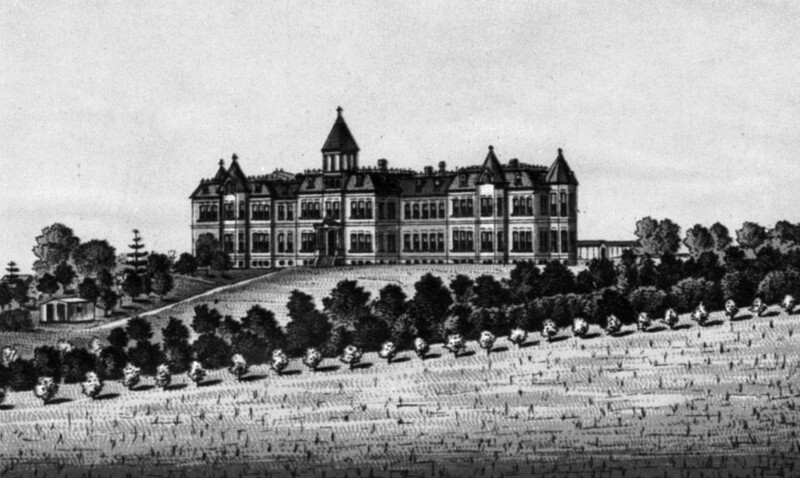 (1880s)* - Lithograph sketch showing St. Vincent's Hospital located on a well-landscaped hill that was originally called Beaudry Park. (ca. 1887)^^* - Photograph of St. Vincent's Hospital (aka Sisters Hospital) as seen from across the lawn. Several trees, most of them palms, are planted in front of the grand hospital that shows numerous windows, dormers, an irregular roof, a cupola or tower, and several chimneys. Six nuns can be seen walking and/or sitting around the front lawn. The Daughters of Charity of St. Vincent de Paul established the first hospital in Los Angeles - the Los Angeles Infirmary, in 1856. It was located in the Sonora Town adobe owned by then-Mayor of Los Angeles, Don Cristo´bal Aguilar. 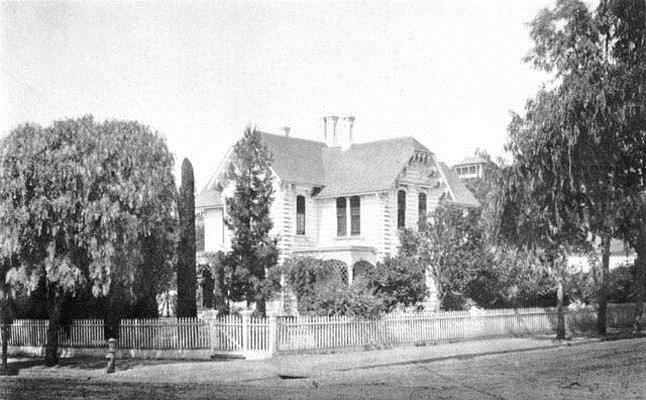 Four years later, in 1860, the hospital relocated to 1416 Naud Street, between Ann (named for Sister Ann) and Sotillo Street (though other data indicates the location was 1414 Naud Street, between N. Main and San Fernando Road). In 1869, Daughters incorporated the Los Angeles Infirmary under their own ownership, the first women in the region to do so. 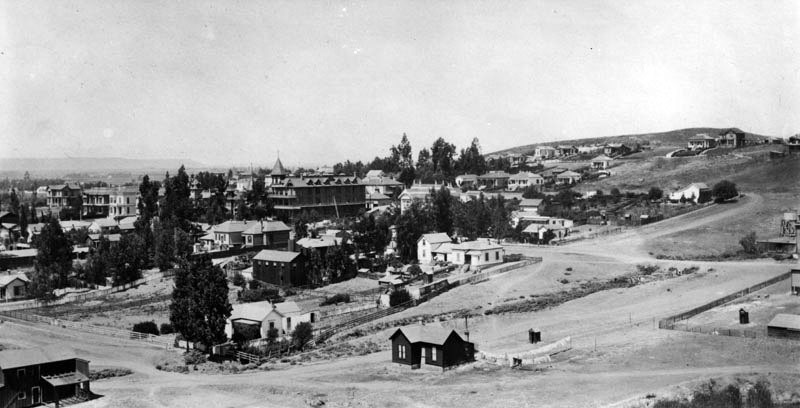 In 1883 they purchased six and a half acres of land at Beaudry Park at a cost of $10,000, and a new hospital building was erected a year later at Beaudry and Sunset, on a hillside overlooking Sonora Town. By 1898, Los Angeles Infirmary had come to be known as Sisters Hospital, but both names were used interchangeably in reference to the same hospital. (ca. 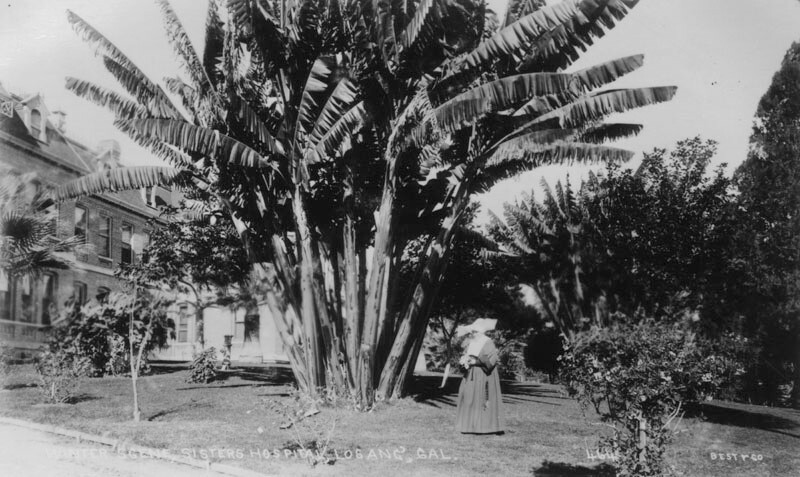 1890s)* - View of Sisters Hospital (aka St. Vincent's Hospital) as seen from behind a cluster of banana trees located on the grounds; a nun can be seen standing in the foreground. More trees hide the rest of the grand hospital, which boasts of numerous windows, dormers, an irregular roof, a cupola or tower, and several chimneys. 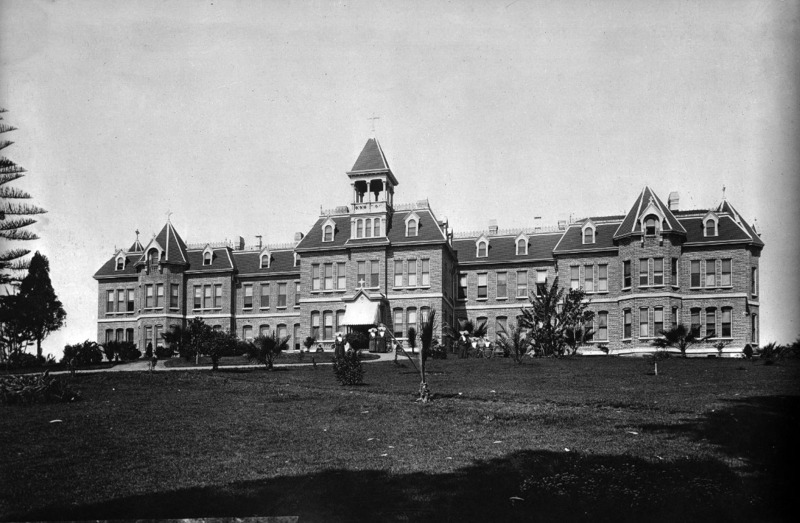 Sisters Hospital (originally St. Vincent's Infirmary) was built in 1884 on six and half acres of what was then known as Beuadry Park (developed by brothers Prudent and Victor Beaudry in 1876). The area today is called Victor Heights. (ca. 1910)^^* - View of Sisters Hospital near Sunset and Beaudry. A new seven-story octagonal tower topped with a dome rises on the corner of the four-story Mission-revival building. A cross is on top of the dome. 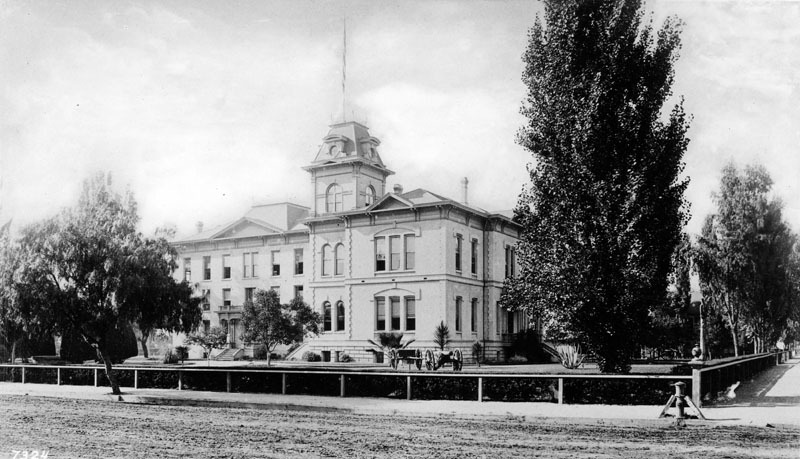 The original building with its unique cupola can be seen at center-right. (1908)^^* - Interior view of the Los Angeles Infirmary (later, Saint Vincent's Hospital), Sunset and Beaudry. 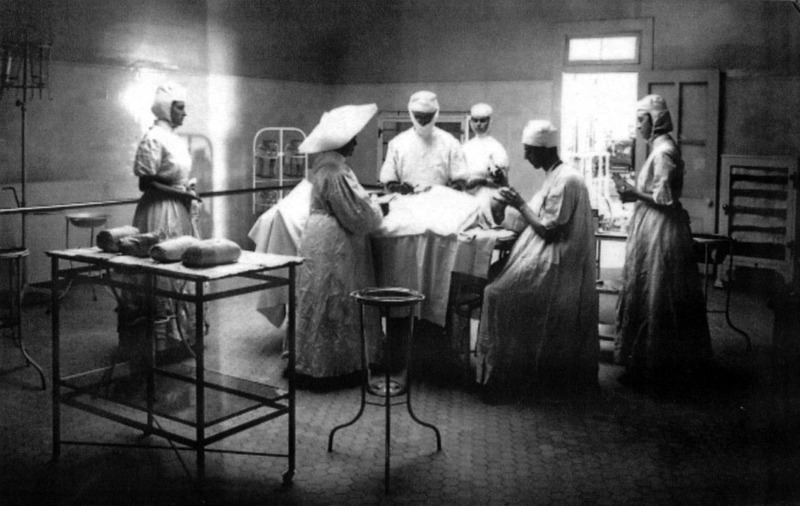 A group of six nurses and doctors surround a patient on an operating table. 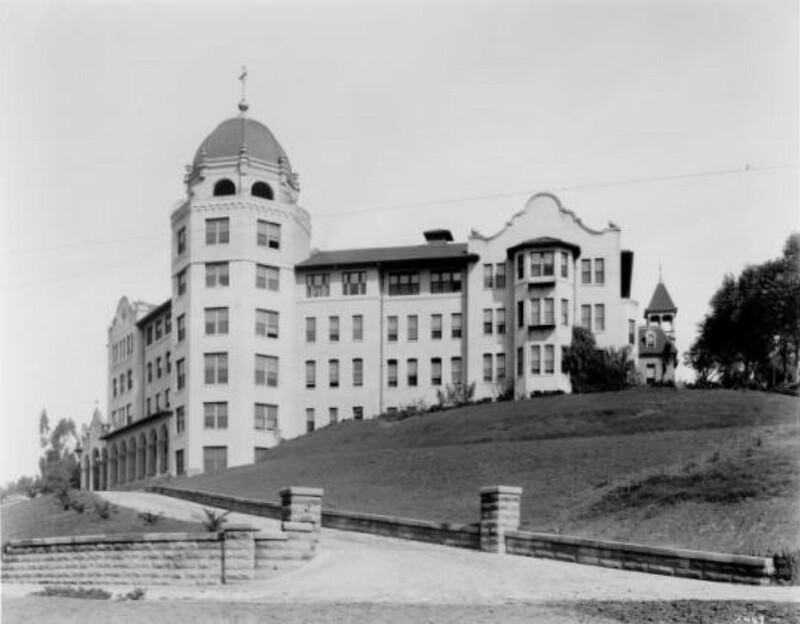 In 1918, the name was officially changed to St. Vincent's Hospital. 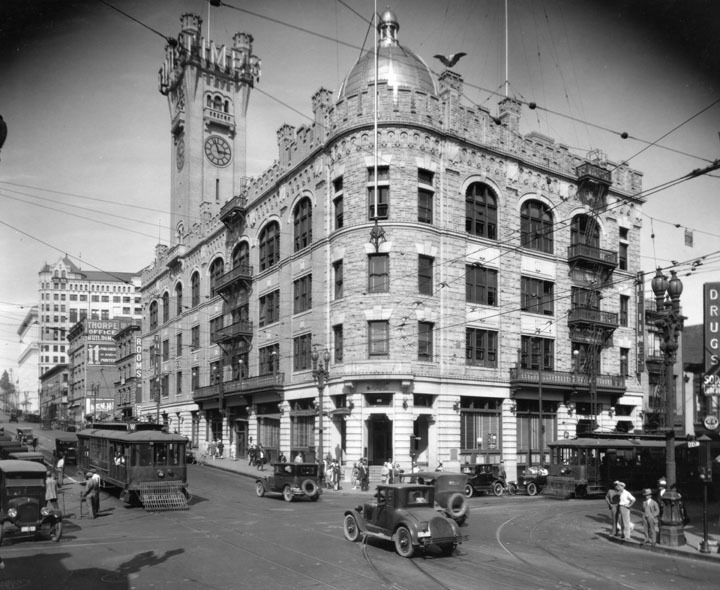 In 1924 a new building was erected on 3rd and Alvarado, which was built by John C. Austin and Frederick M. Ashley. For 47 years, the hospital had such a steady growth that they were forced to expand yet again, and groundbreaking for a newer, larger building took place in 1971 - this time, located at 2131 W. 3rd Street. With a "new" hospital came a new name, and in 1974, it changed again, this time becoming St. Vincent Medical Center. Click HERE to see more on the new 1924-built St. Vincent Hospital. (ca. 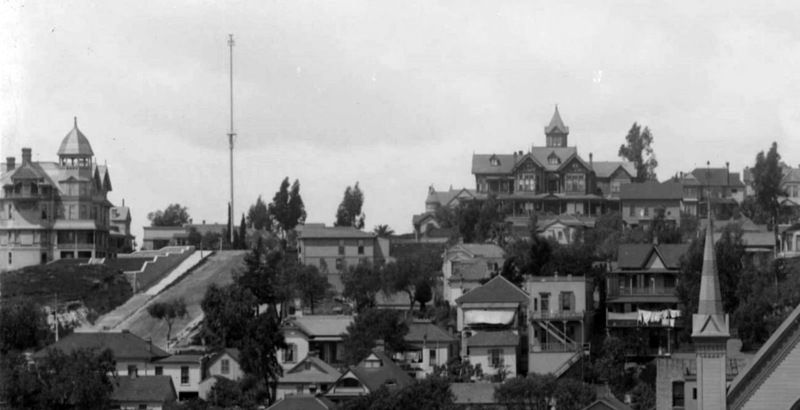 1887)* - View of Los Angeles College, located on the southwest corner of Eighth and Hope streets. Photograph shows a three-story wooden building with jutting towers on each corner, narrow fire-escapes on the second and third floors along the right side of the building, and numerous windows throughout the entire structure. A low fence and hedge surrounds the college. Rev. 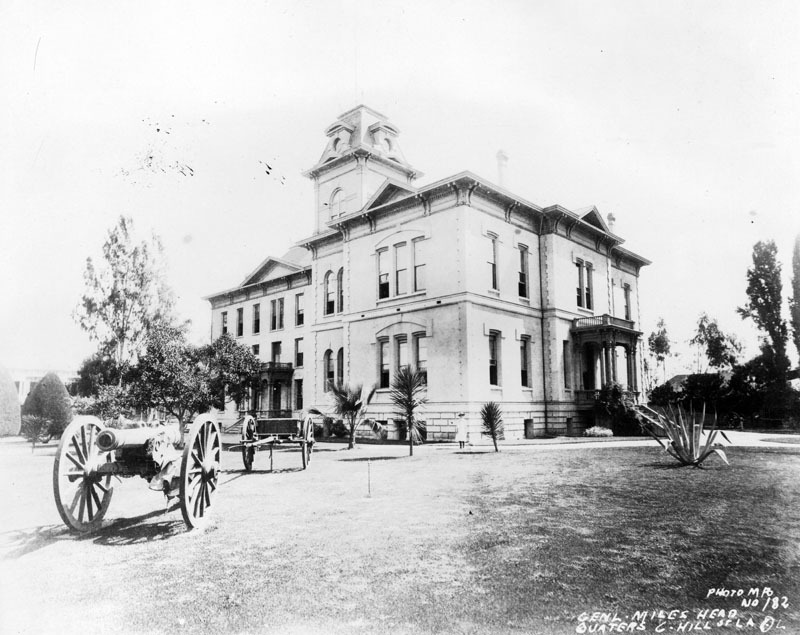 D.W. Hanna, one of the pioneer educators of Los Angeles, opened the Los Angeles College for Young Ladies, better known as Hanna College, on September 2, 1885. At the time, it was the only institution in the city that provided exclusively for the higher education of young women. 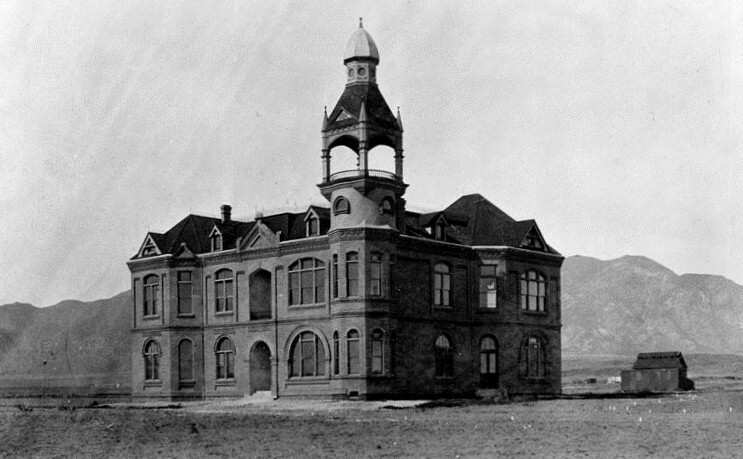 The school was originally located in a couple of buildings on the corner of Fifth and Olive streets. By 1887, having formed a stock company, Hanna erected a new, larger school structure on the southwest corner of Eighth and Hope streets. With 350 students enrolled at that time, the college prospered and was a popular girls' boarding school, where many of the most exclusive families sent their daughters to be educated. (ca. 1903)^^* - View showing the Abbotsford Inn, previously the Los Angeles College for Young Ladies, located on the southwest corner of Eighth Street and South Hope Street. 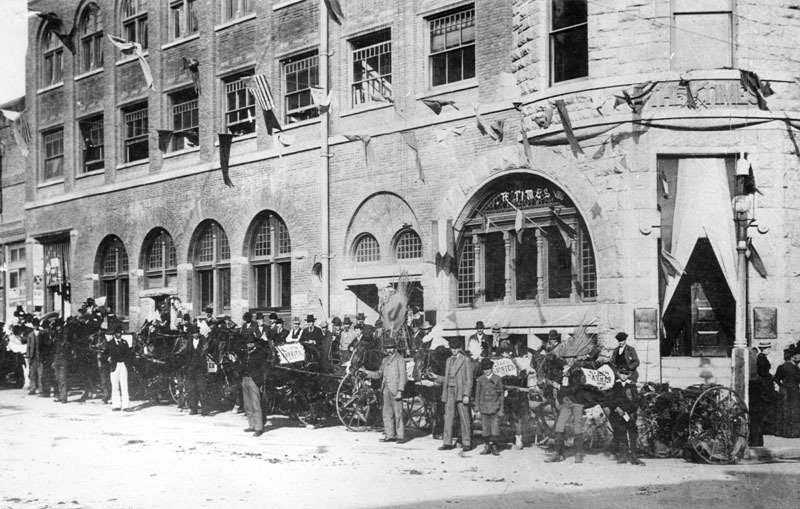 People are posed along the porch to the left of the inn, in front of a horse-drawn carriage parked along the sidewalk. The street shows streetcar rails embedded in it. (ca. 1887)^^* - View of the Los Angeles National Bank building on the northeast corner of 1st and Spring Street where City Hall is today. (ca. 1890)* - View of the Los Angeles National Bank at the northeast corner of First and Spring streets, in downtown Los Angeles. 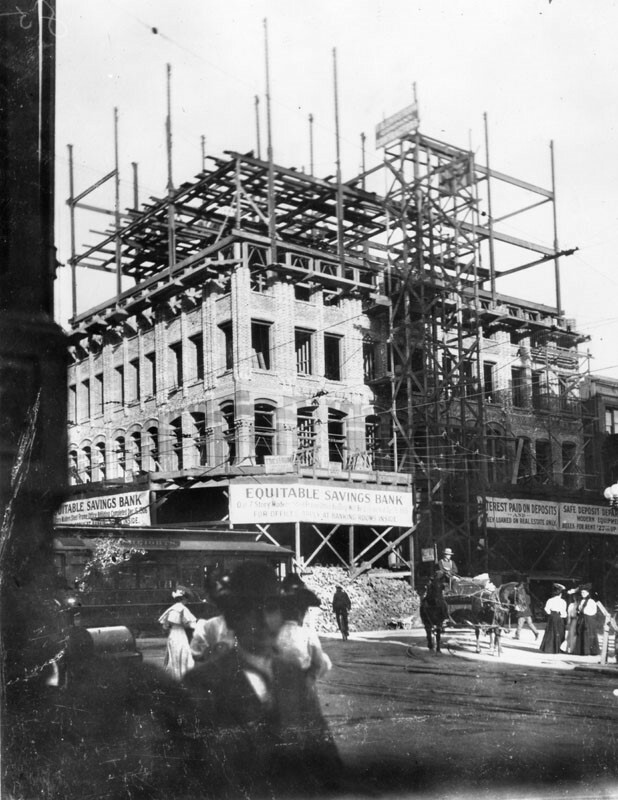 (1906)* - View of the construction of Equitable Savings Bank, a seven-story structure that replaced the Los Angeles National Bank building at the northeast corner of 1st and Spring. 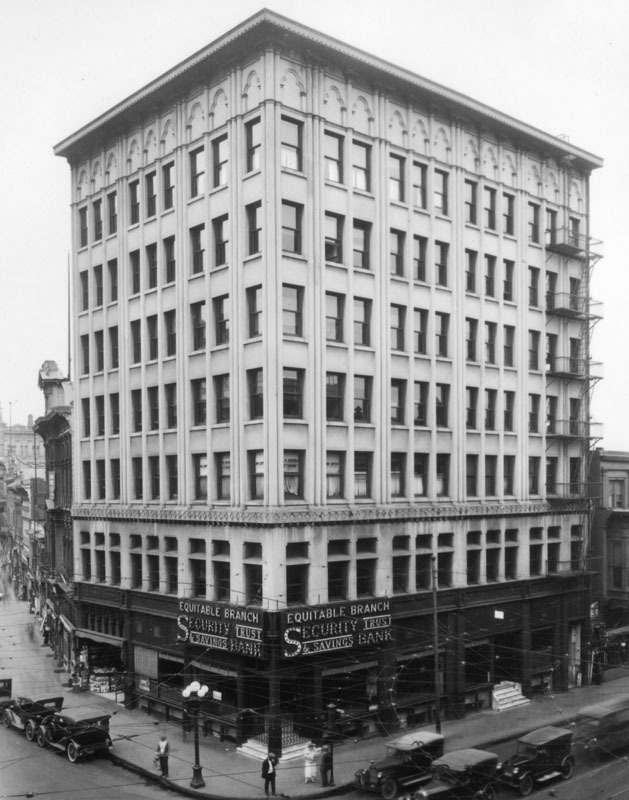 (1920)s* - Exterior view of Security Trust and Savings Bank at First and Spring Streets, in the Equitable Building. (2014)#^** – View looking at the northeast corner of Spring and First Streets where the Equitable Bank Building once stood, now a park next to City Hall. (ca. 1880s)* - The southwest corner of Broadway and 2nd St., showing the house built in 1870 for Judge O'Melveny. (ca. 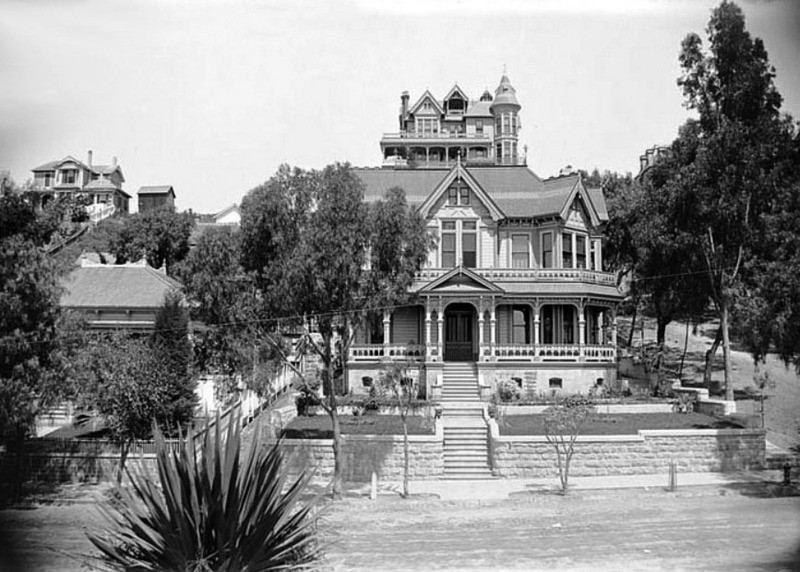 1880s)* - Exterior view of the Brunson Mansion, located at 347 S. Grand Avenue on Bunker Hill. (ca. 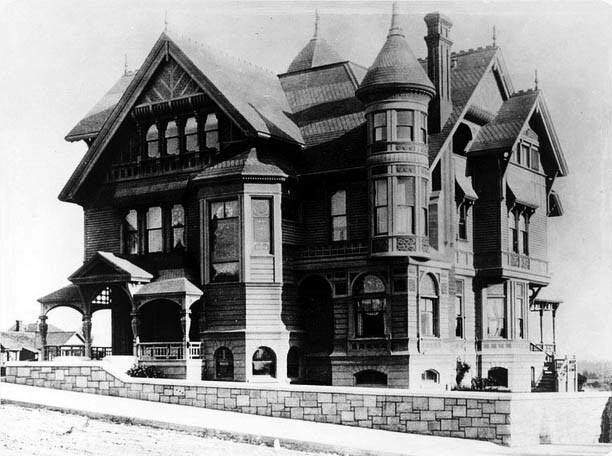 1880s)* - Front view of the Brunson Mansion on Bunker Hill. Note the man standing on the lawn in front of the house. 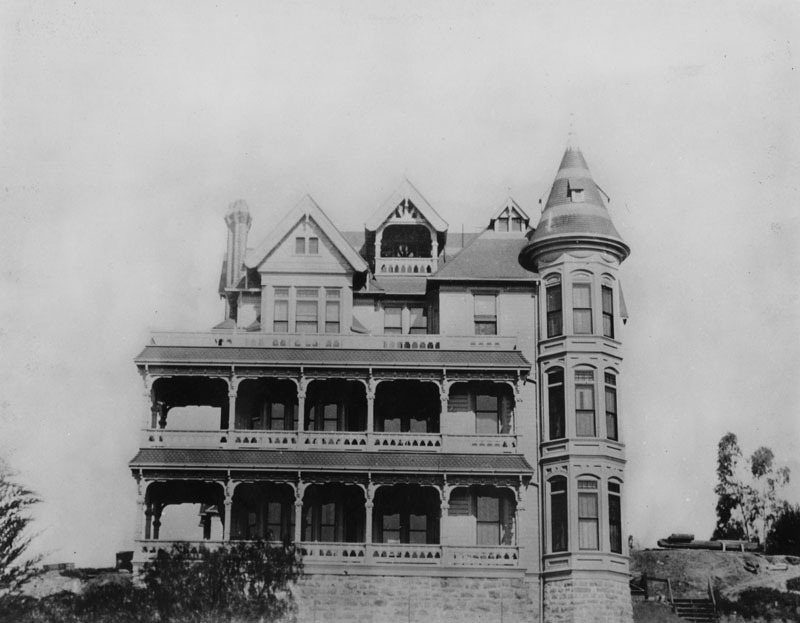 The Brunson Mansion at the corner of Fourth Street and Grand Avenue was an imposing structure that seemed destined to stand indefinitely. Instead it would last less than four decades and become an early victim of the City's obsession with the automobile. (ca. 1890)^^* – View looking west toward Bunker Hill showing the impressive Brunson Mansion at center-right with the Rose Mansion at far left. Note the 150-ft tall streetlight at center-left. Click HERE to see more Early Views of LA Streetlights. At the turn of the century, the 18 room property became the Hotel Brunson and would remain a boarding house for thirteen years. (1886)* - View of Bunker Hill from Hill and 3rd looking northwest. 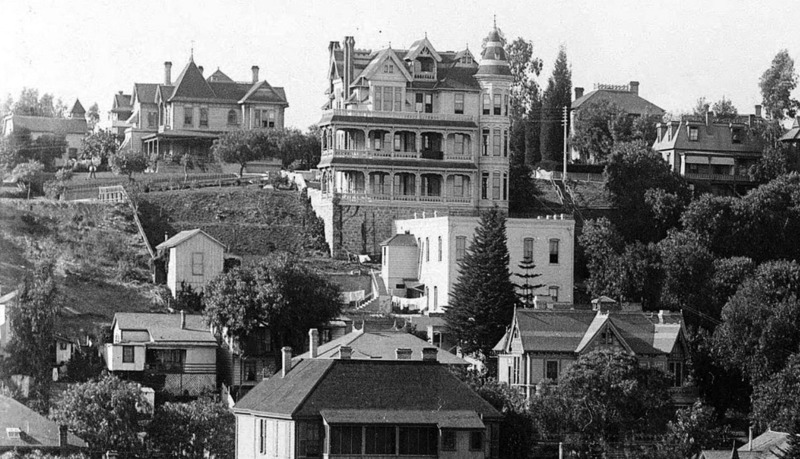 The Crocker Mansion, located at 3rd and Olive, can clearly be seen at the top of the hill. (ca. 1886)* - View of Edwin B. Crocker's residence located at 300 S. Olive near 3rd Street. The mansion can be easily seen sitting majestically atop Bunker Hill, despite numerous tall trees that surround it. (ca. 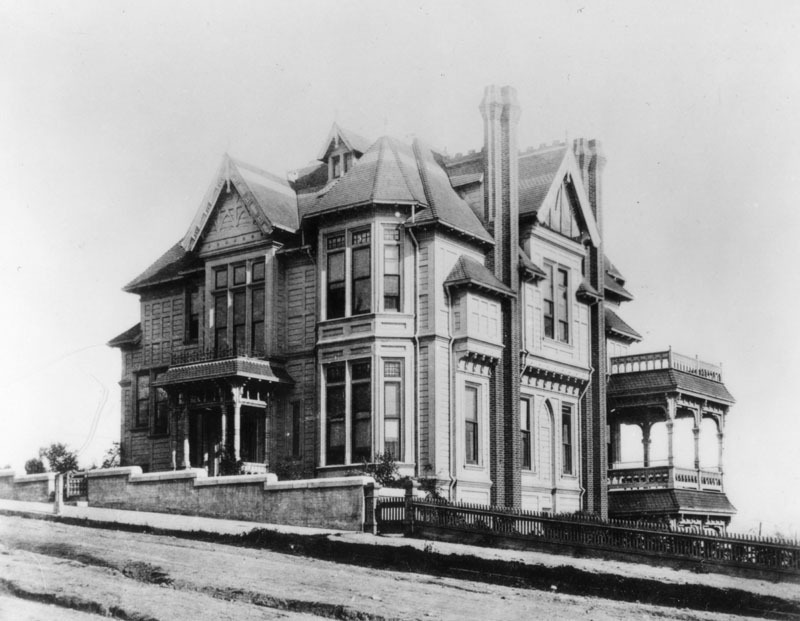 1887)* - The Crocker Mansion, located on the south east corner of 3rd and Olive street. 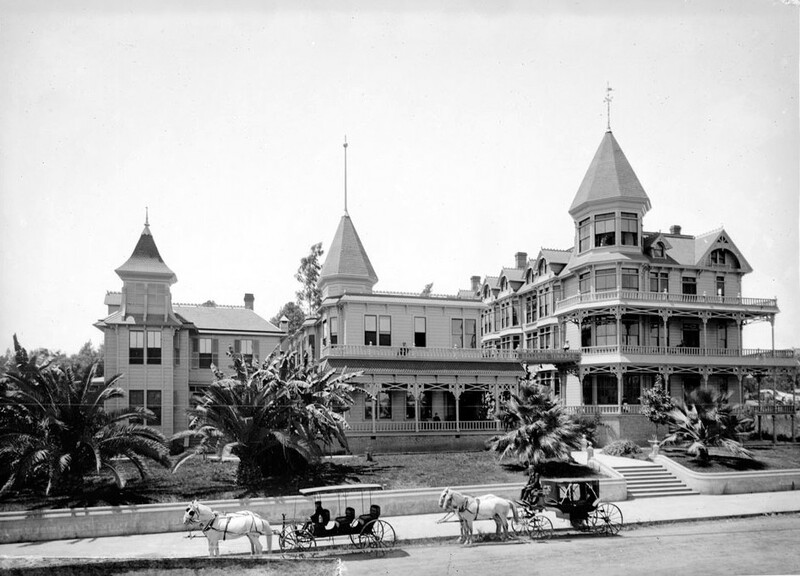 This photo shows the back entrance of the mansion, as well as a horse-drawn carriage with three women and a child taking in the spectacular views of Downtown Los Angeles. (ca. 1888)* - Looking across an unpaved Olive Street, just south of 3rd Street, towards the Crocker Mansion on Bunker Hill. (ca. 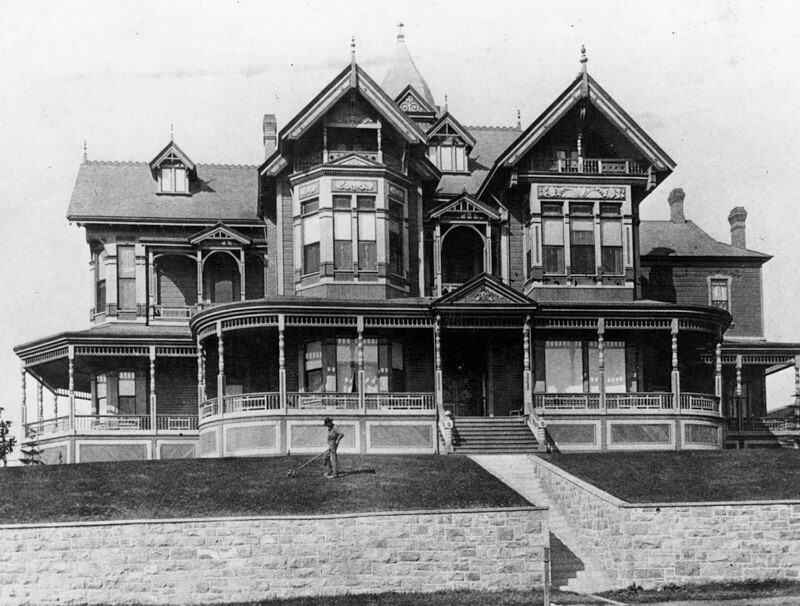 1890)^^* - Partial view of the Crocker Mansion looing northeast showing its brick foundation, porch and balcony. (ca. 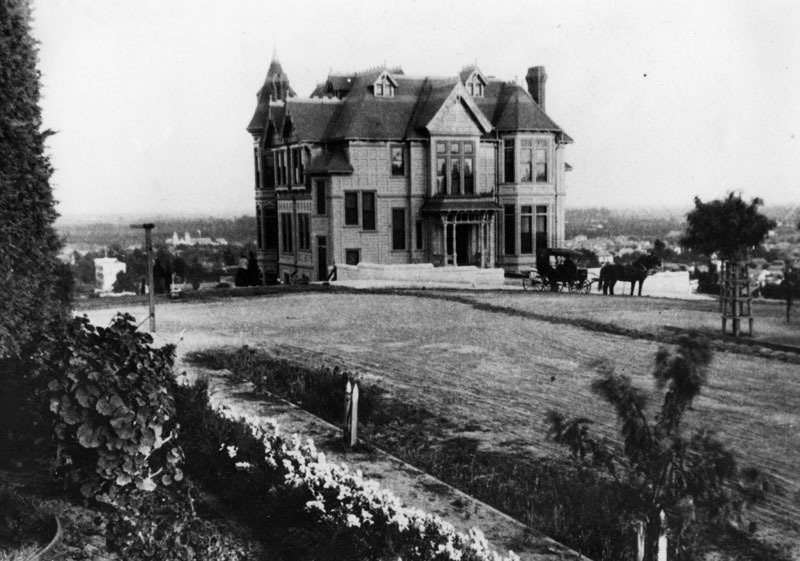 1890)* - Rear view of the Crocker Mansion showing the full extent of its wide balconies where you could get a great view of the emerging metropolis of Los Angeles. 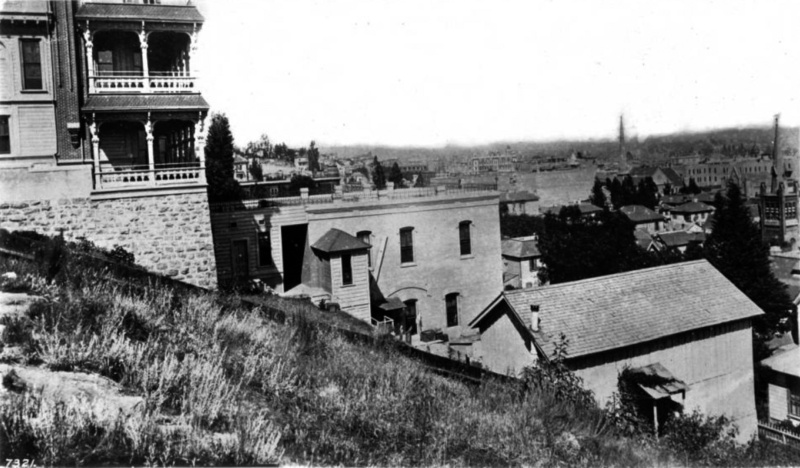 (1895)*#*# – View looking west at 3rd and Hill Streets with the Crocker Mansion seen at the top of Bunker Hill. The southwest corner of 3rd and Hill (lower-right) would become the lower station terminal of Angels Flight. 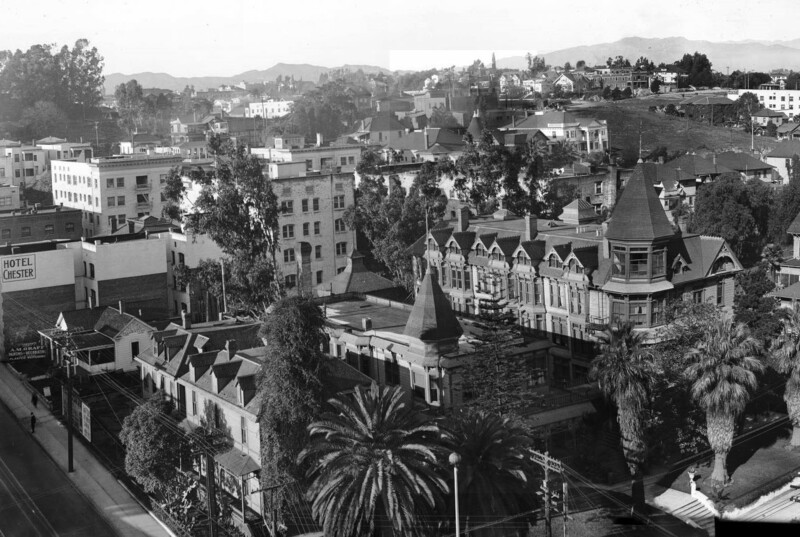 (1898)^^* - Panorama view from 3rd and Spring streets showing the Crocker Mansion and neighbors on Bunker Hill. (1901)* - 3rd Street, looking west, with a close-up view of a streetcar near the recently completed 3rd Street Tunnel in Bunker Hill. The Crocker Mansion stands tall at the top of Bunker Hill. 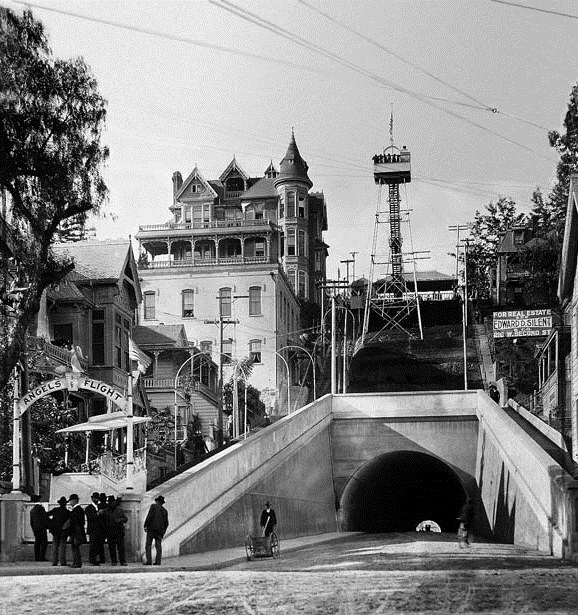 On July 3, 1893, residents and taxpayers presented a petition to the Los Angeles City Council asking that a tunnel be created to connect those who lived in the Crown Hill neighborhood with the business district located on this side of Bunker Hill. Their plans called for a tunnel 1080 feet long, with a twenty-six foot roadway and eight foot sidewalks. Nothing happened for five years. In 1898 the City Council ordered the City Attorney to draw up an ordinance putting tunnel bonds in front of the public via a special election. 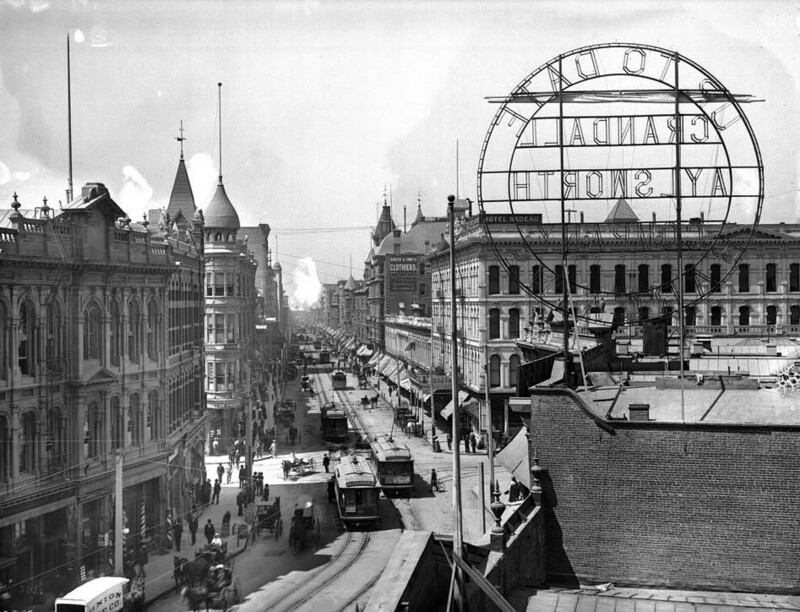 That election was held on July 6, 1898, and funds were approved for both the Third Street and Broadway tunnels. On January 21, 1900, a serious disaster struck. Thirteen men were "entombed" in the tunnel dig after a massive cave-in on the western end. Several were killed in the collapse, but others were trapped inside with only the air in the tunnel. Frantic efforts were made to dig into their position. Ten men were rescued, while three perished. Angel's Flight would open within a year of completion of the 3rd Street Tunnel. (1901)^*# - Photo of Angels Flight at the grand opening of the railway, December 31st, 1901. An observation tower was also constructed on top of the hill adjacent to the Crocker Mansion. Click HERE to see more Early Views of Angels Flight. (ca. 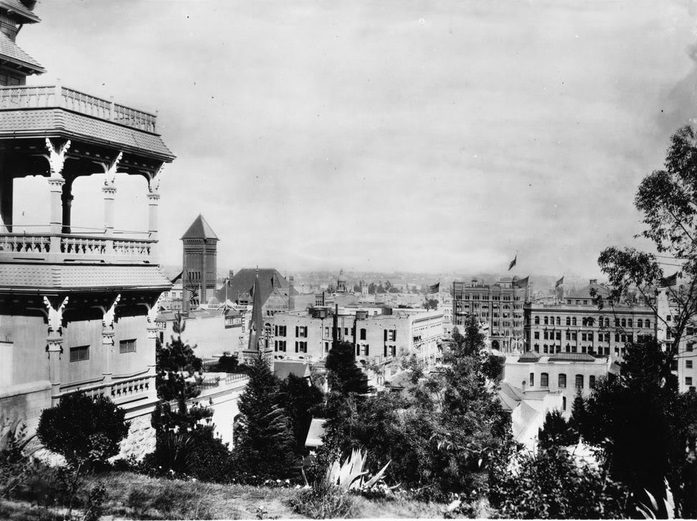 1900)^^* - Panoramic view of downtown Los Angeles from the Crocker Mansion (partially visible at left) looking east on Third Street from the intersection of Olive Street on Bunker Hill. Flags are flying on several buildings, including the Bradbury Building (Third Street and Broadway). 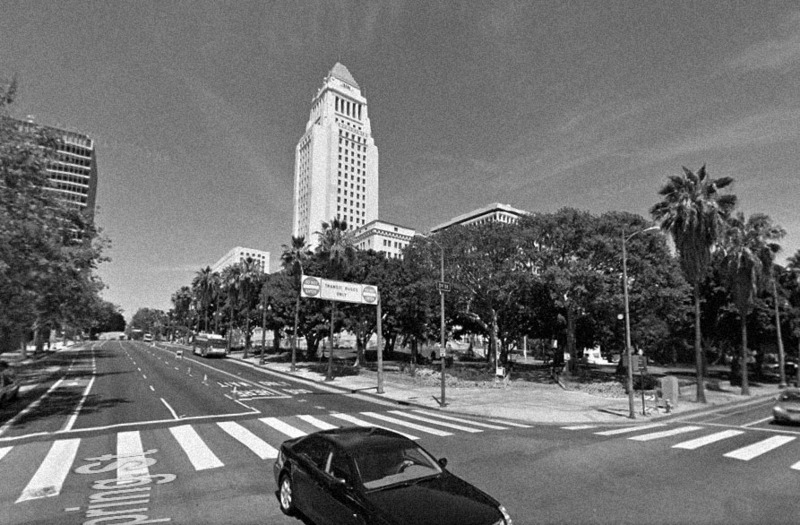 The Los Angeles City Hall, with its distinguished tall tower, is seen just to the right of the mansion. (1888)*##^ - Exterior front corner view of the Leonard John Rose Victorian home at 400 South Grand Avenue. (ca. 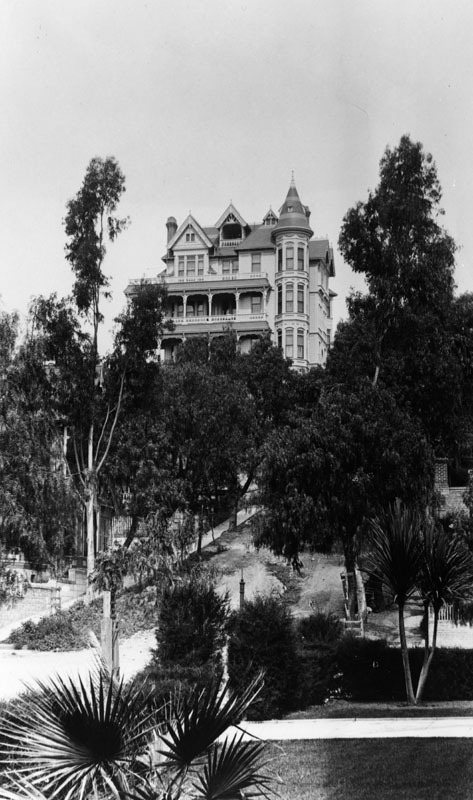 1890)* - Exterior of the mansion owned by businessman Leonard John Rose, located on the southeast corner of Grand Avenue and 4th Street on Bunker Hill. (ca. 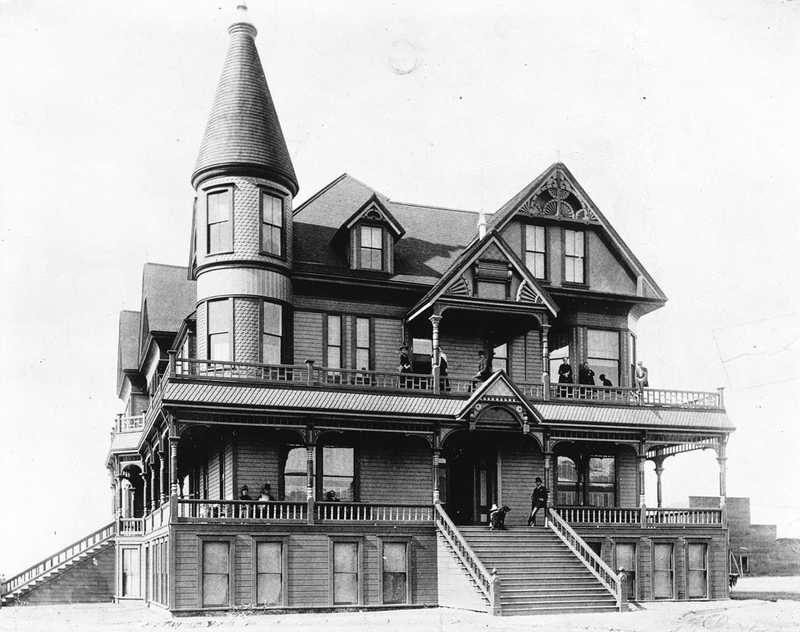 1888)* - Exterior front corner view of the three-story Victorian style home of Pierre Larronde at 237 N. Hope Street, Bunker Hill. At one time, the name Larronde was a fairly well known one in the City of Angels. Pierre Larronde was a native Frenchman who landed in San Francisco in 1847 and made a killing in the gold mines. When he relocated to Los Angeles in 1851, he amassed a further fortune by successfully raising sheep on one of the Ranchos. Always the astute businessman, Larronde cashed out his sheep empire in the late 1880s and focused his energies on real estate. His holdings included prime land at the corner of First and Spring, and a parcel on North Hope Street near Temple where he built the family home. 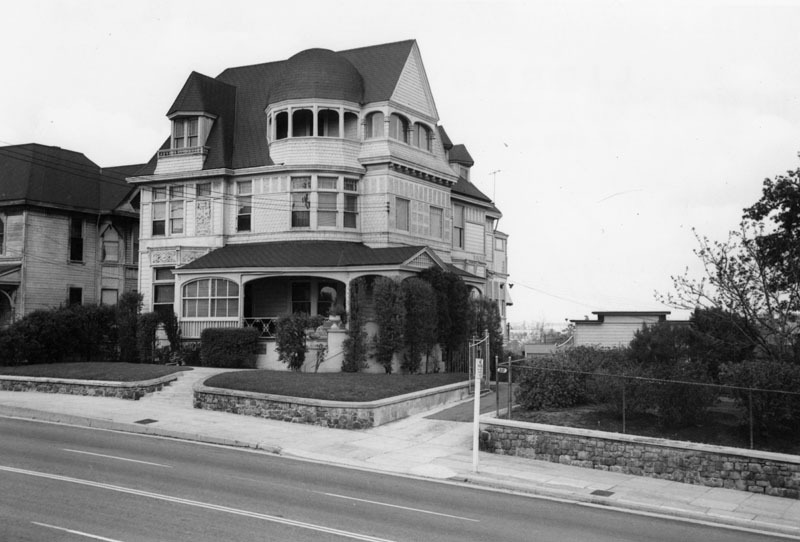 (1954)* - Exterior of the Queen Anne Revival style home, located at 237 N. Hope Street. It was demolished in 1957. Pierre Larronde had a great deal in common with a fellow Los Angeles pioneer named Jean Etchemendy. Both men hailed from a south western region in France called the Basses-Pyrenees, both briefly lived in South America before cashing in early on the Gold Rush, and both successfully settled in Los Angles as sheep ranchers. Last but not least, both men married a gal named Juana Egurrola. Juana was born in Marquina, Spain but moved to California with her family at a very young age. She married Etchemendy in 1865 and gave birth to daughters Mariana, Madeleine and Carolina. Jean Etchemendy died in 1872 and Juana mourned for a couple of years before hooking up with the other French sheep-man in town. Juana’s 1874 union with Pierre Larronde produced three children, Pedro Domingo, John and Antoinette. (ca. 1887)* - Exterior view of Hazard's Pavilion. Erected in early-mid 1880; demolished around 1905, it is the present site of the Philharmonic Auditorium. 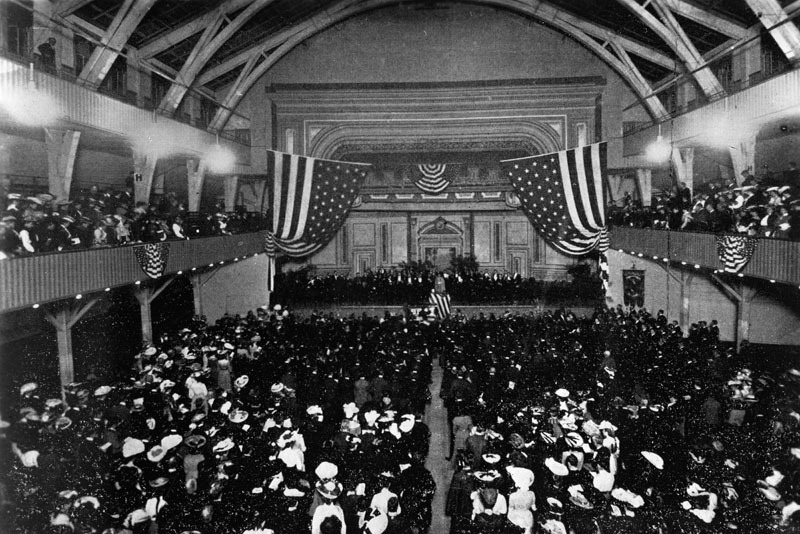 (1903)* - A public reception being held inside the Hazard's Pavilion in May 4, 1903. The pavilion was erected in 1887 and demolished around 1905. The Philharmonic Auditorium was built in its place. 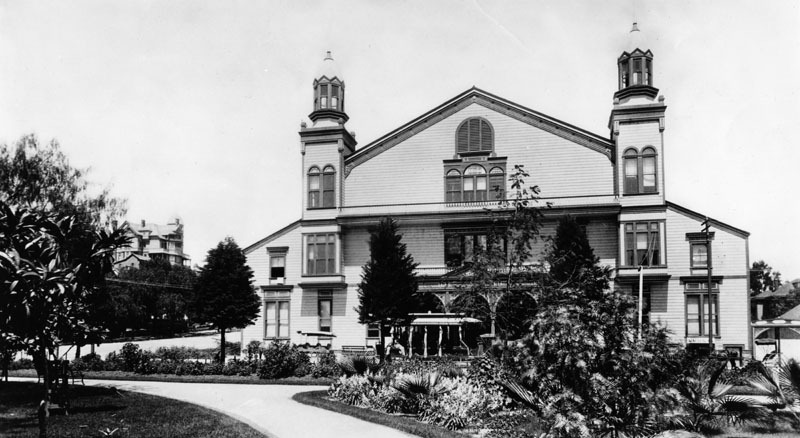 (1895)* - Hazard's Pavilion as seen from across the street. Location: Intersection of 5th and Olive Streets. From 1901 to 1904, the first great Los Angeles boxing promoter, Uncle Tom McCarey, staged his first boxing shows at the pavilion. It would be McCarey who put the Los Angeles area on the map as a major boxing venue. Many famous boxers fought at the Pavilion.The future World Heavyweight Champion, Jim Jeffries, had only one fully recorded bout in Los Angeles, his hometown, when he fought Joe Goddard there in 1898. The man who would go on to be the first World Heavyweight Champion, Jack Johnson, fought in eight main events on cards staged by Tom McCarey at the pavilion during a period from 1902 to 1904. (ca. 1887)* – View of the Panorama Rotunda showing the Battle of Paris. 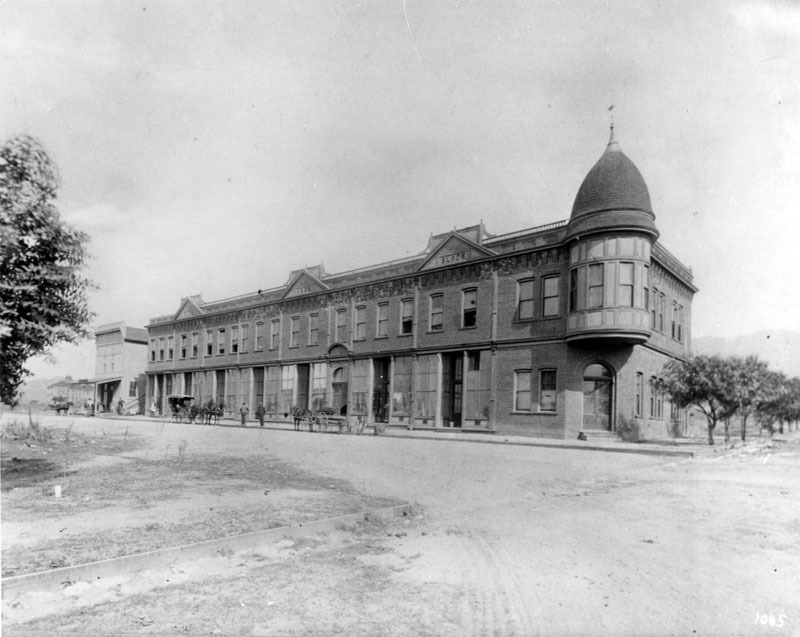 The large round building is seen from the rear and sits in the middle of the block bounded by 3rd, 4th, Main, and Los Angeles streets. The Panorama is an art form which encircles the spectator with an illusion of continuous space, often in a painted 360º format. Patented by Englishman Robert Barker in 1787, this spectacular visual entertainment flourished throughout the 19th century, mostly in Europe and the United States. (ca. 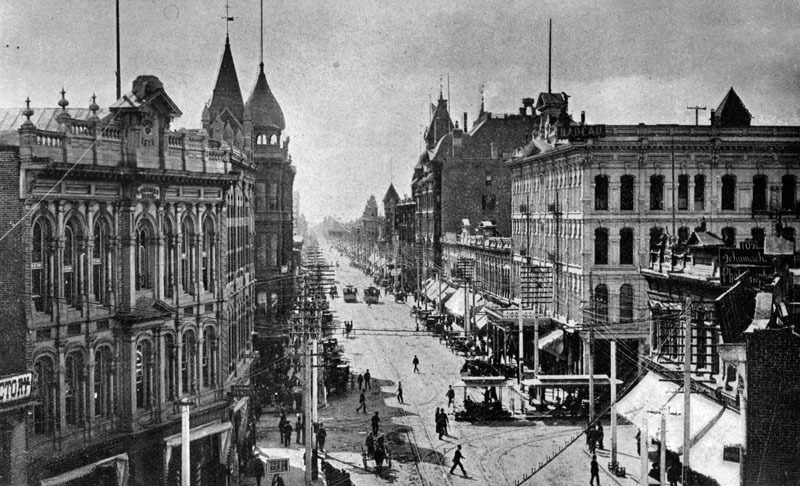 1890)^^* - View of Main Street south from 3rd Street. showing the Panorama Building. The Panorama Rotunda is conected to this building and stands to the rear, out of view. The Westminster Hotel, located on the northeast corner of 4th and Main streets, is seen at far right. (1906)^*# - Sanborn map showing the location of the Panorama Building and the large rotunda, now called the Panorama Skating Rink. The Westminster Hotel is at lower-left (N/E corner of 4th and Main). As the city continued to grow and change, the painting was removed, and the rotunda began to take on an array of ventures. 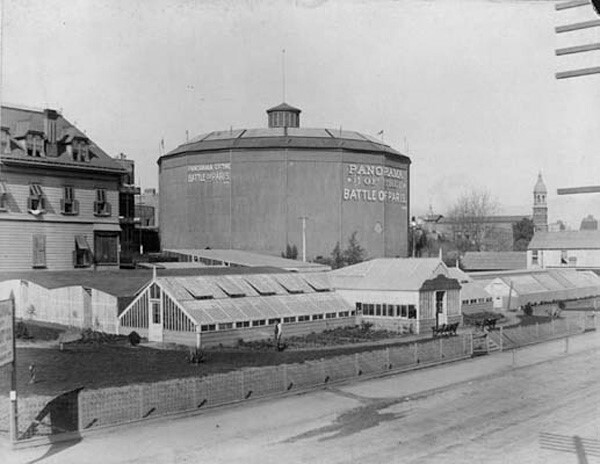 Throughout the 1890s and early 1900s, the rotunda housed Empire Stables, also seen in the previous image. 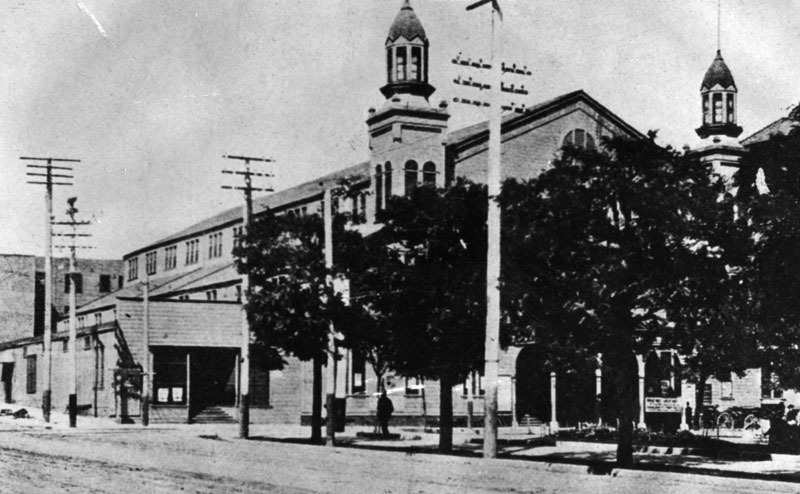 In 1906 it was configured into a grand state-of-the-art roller skating rink. (ca. 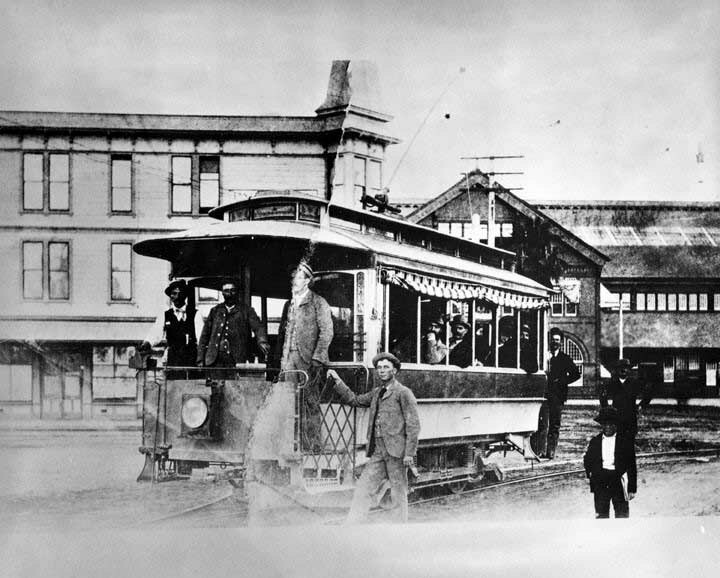 1888)* - Two separate cable cars arrive at the same location (7th and Grand) from different directions. The southwest corner building is the main power station for the Pacific Railway Company (formerly Los Angeles Railway). 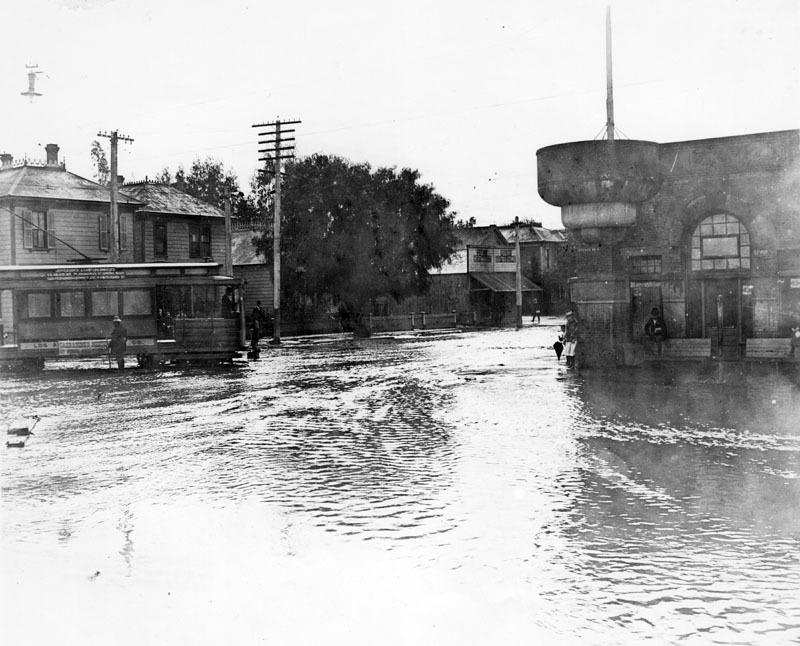 (1890s)* - View of a flooded intersection at 7th Street and Grand Avenue. On the right, two men stay on high ground trying to avoid the rising water. To the left, a cable car appears to be stalled in the middle of the intersection. 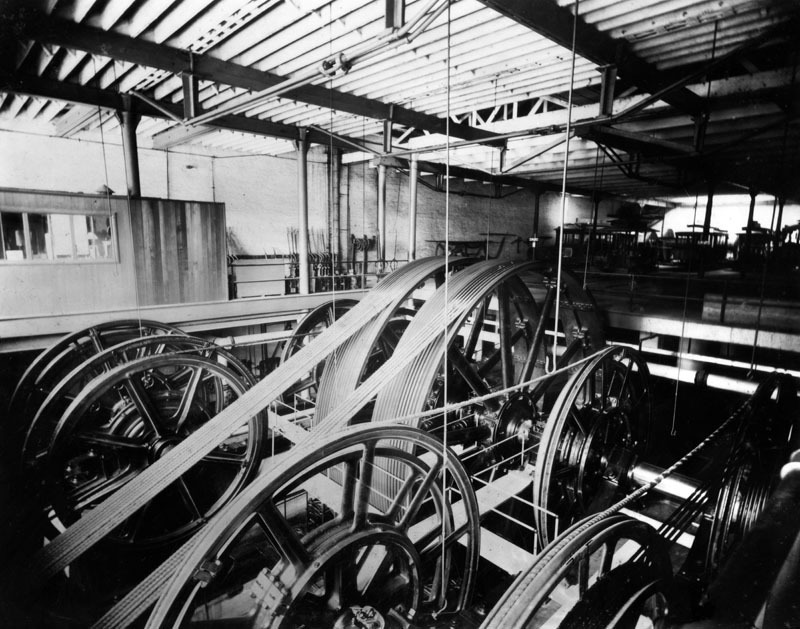 (1890s)* - Interior view of the Pacific Railway Company power house, located at 7th and Grand, where huge wheels controlled the lines pulling the cable cars. 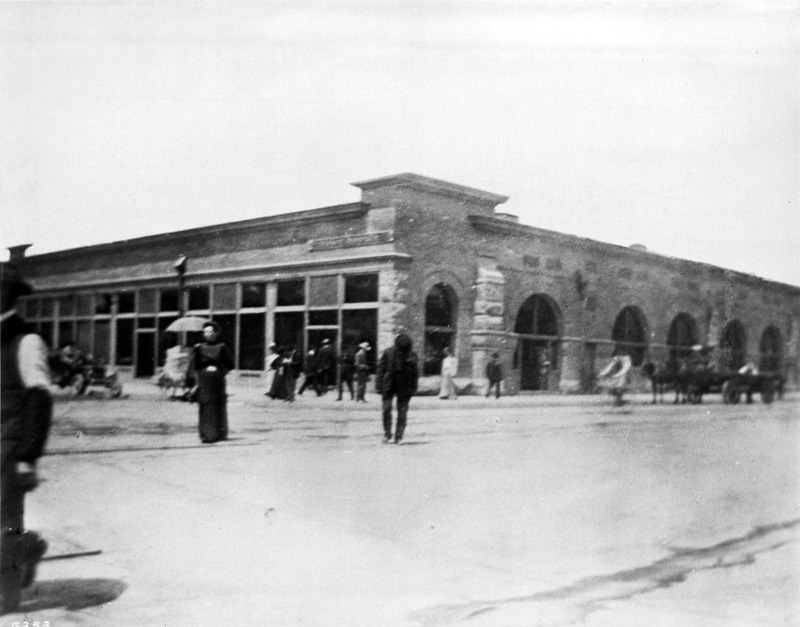 (1906)^^* - Several people are seen crossing the street at the interscetion of 7th Street and Grand Avenue. The old Pacific Railway power house as been converted into a Post Office. The Romanesque architecture of the one-story building sports six visible arched windows to the right wall, while showing fourteen rectangular one-over-one sash windows to the left. (1907)* - View of the unpaved intersection of 7th Street and Grand Avenue, where a post office building sits on the southwest corner. This site later became the location of the large J.W. Robinson's store. 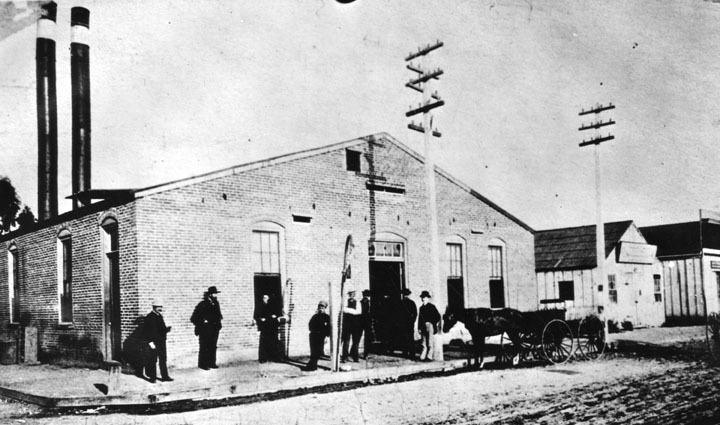 (1888)* - View of Banning Street electric plant located on the corner of Alameda and Banning Streets. Photograph marked 1888 shows a brick building with men and a horse and buggy in front of it. 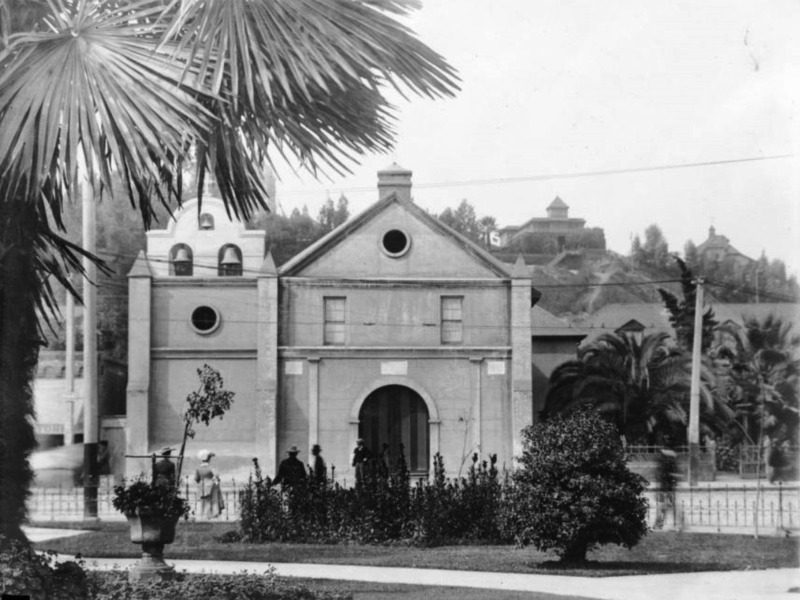 Click HERE to read the story behind LA's first electric power plant in Early Power Generation. (ca. 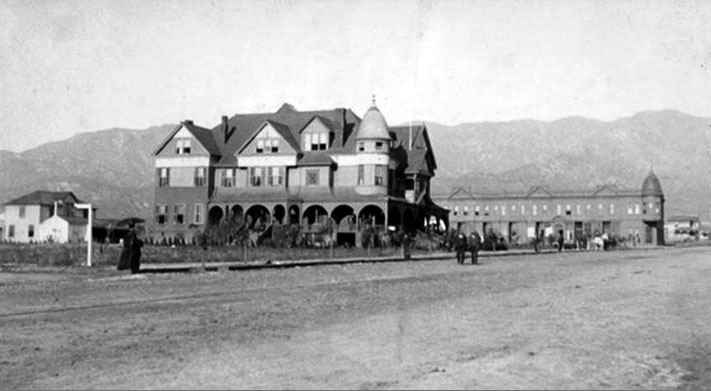 1888)^^* - Exterior view of the Mission Hotel in San Fernando, ca.1888. 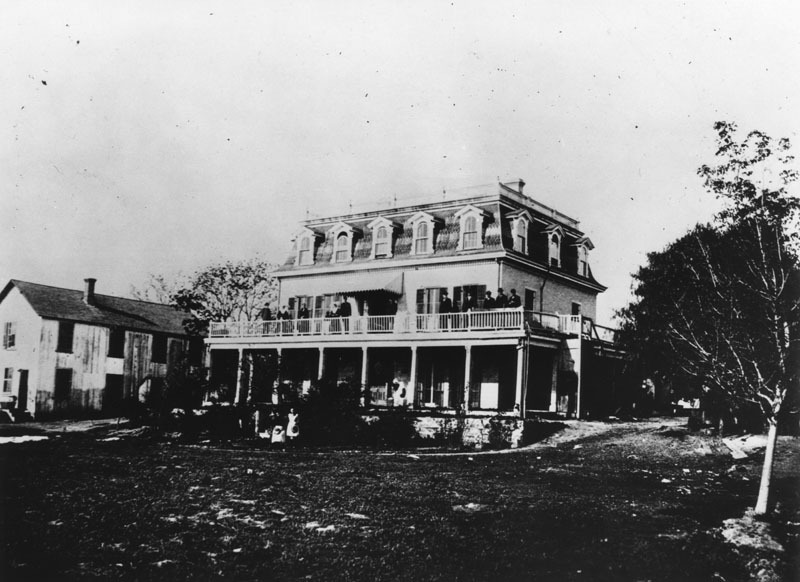 The three and a half-story, Victorian-style hotel is shown at center, with people posing on its porch and balcony. On the second floor a man can be seen leaning against one of the beams which support the overhang near the hotel's entrance. A dog is visible near him at the top of the front steps that lead to the second floor and the subsequent entrance. On the second floor to the left, a two-story tower extends from the hotel, decorated in gingerbread clapboard. (ca. 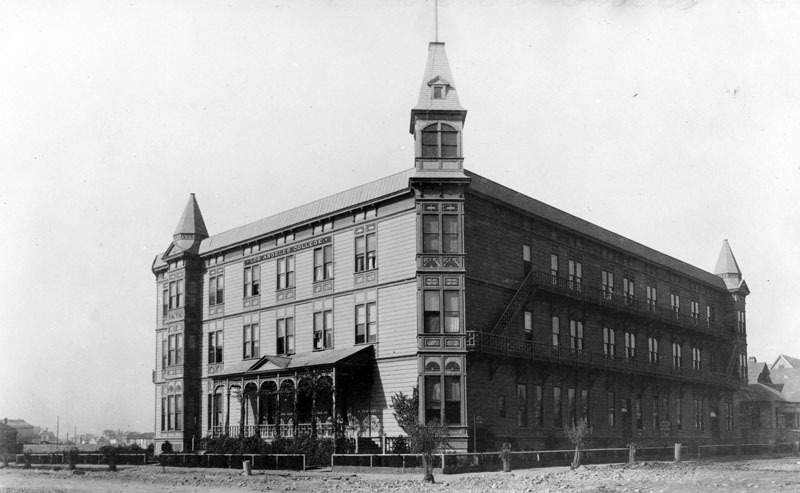 1890)* - Exterior view of the Porter Hotel (also called the Mission Hotel). Building was built in 1887, on a knoll about a mile from the center of San Fernando. 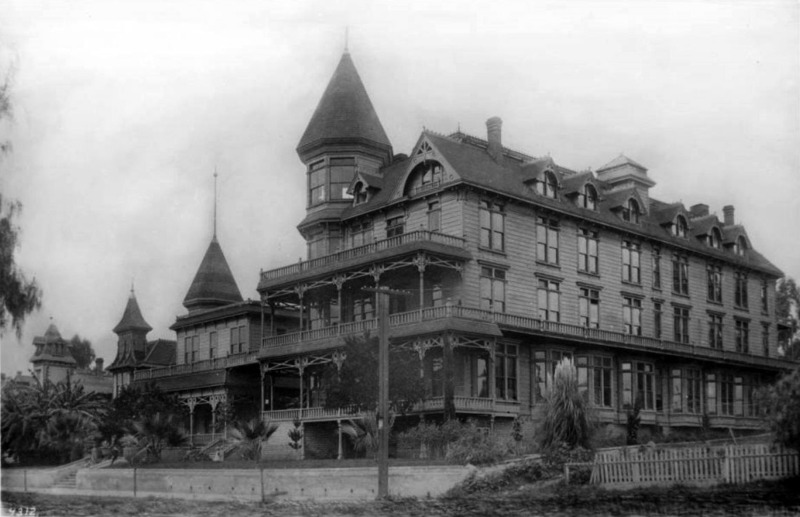 It served as a hotel for about a year, and later, as a summer residence for the Porter family, 1890. 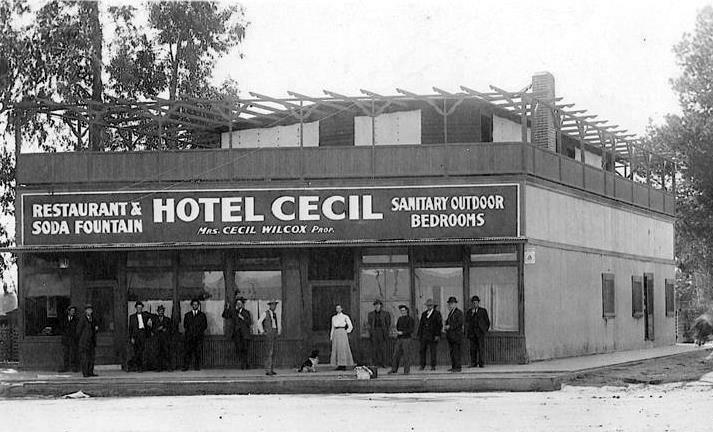 (1888)^*^^ – View of the Hotel Cecil in Lankershim (North Hollywood). It was one of the first hotels in the San Fernando Valley. Pictured in the center is the owner, Mrs. Cecil Wilcox, with a dog by her side. A dozen men surround her, all posing for the photographer.